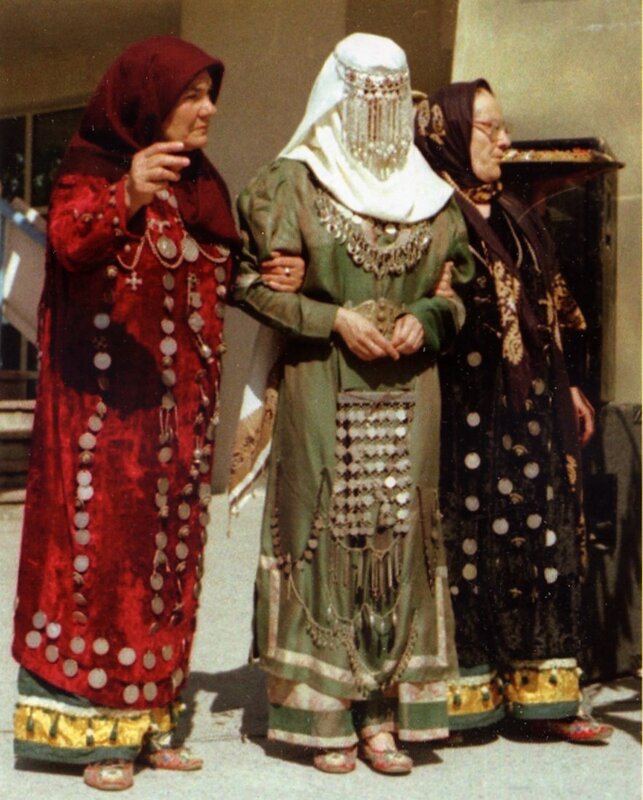 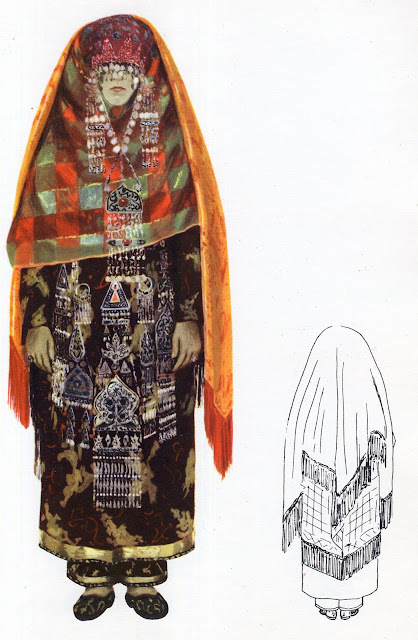 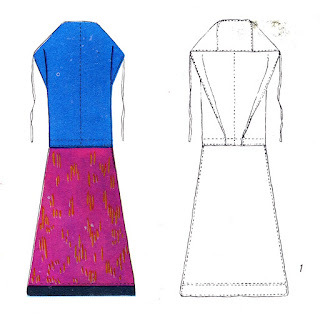 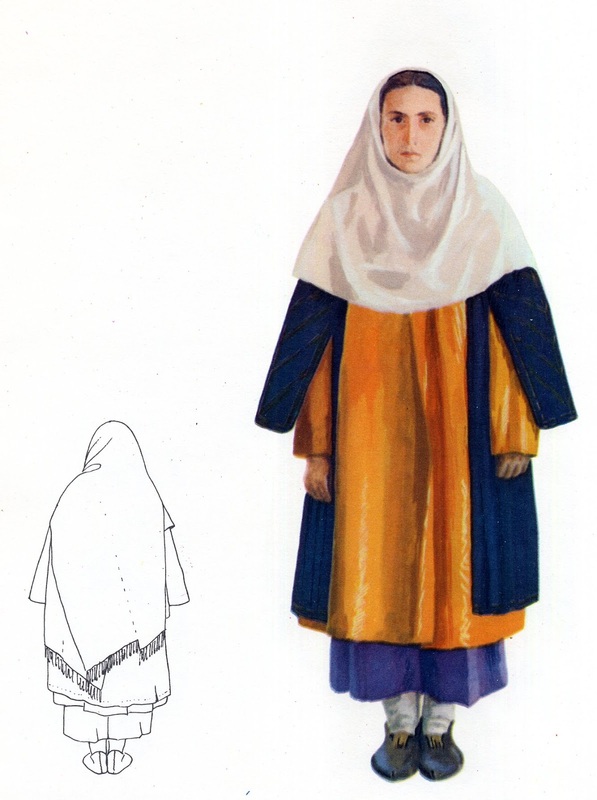 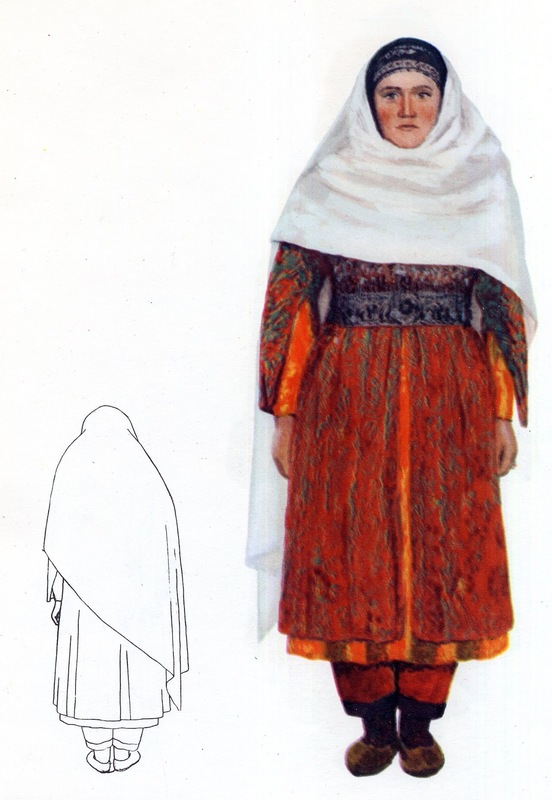 today I will attempt to give some sort of overview of the costumes of Dagestan. 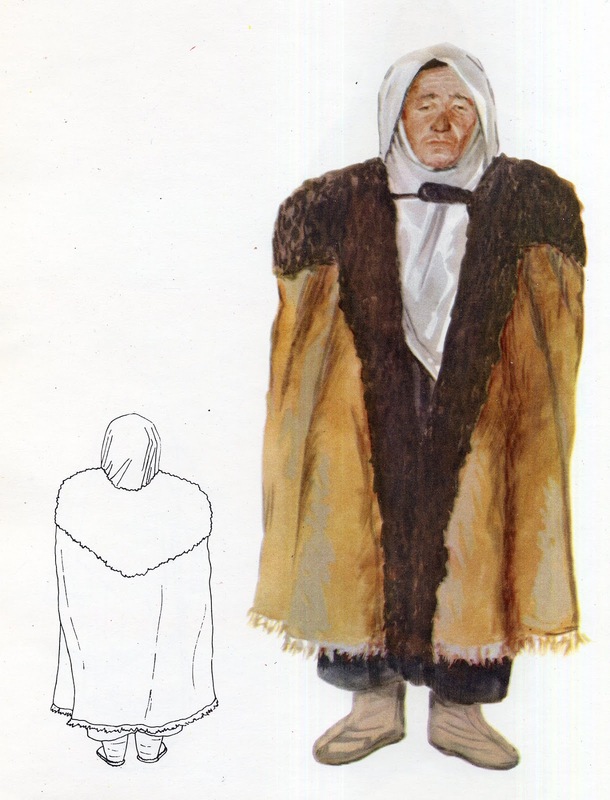 The two images above show the standard men's costume for the entire area, and a group of women in the costumes of some of the various ethnic groups found there. 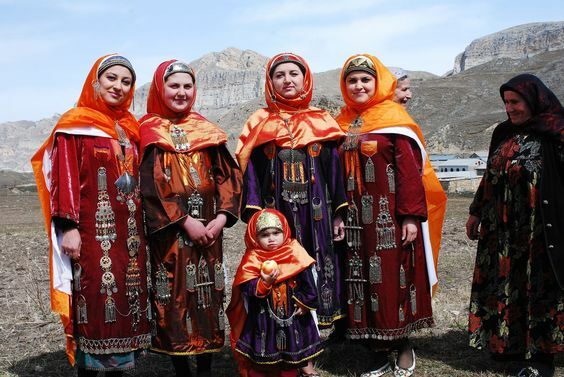 Dagestan is in the extreme southeast corner of Europe, on the west coast of the Caspian Sea. 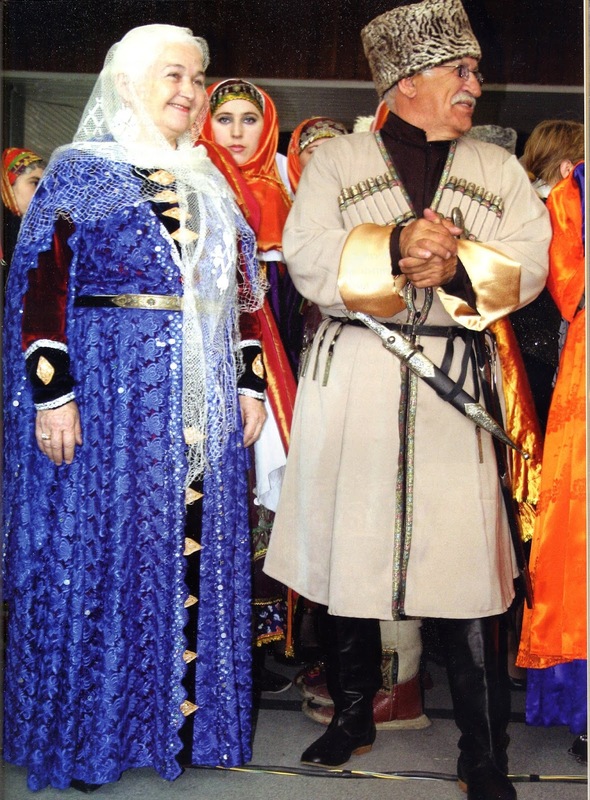 It is bordered on the north by Kalmykia, on the west by the Stavropol' Kraj of Russia, Chechnia and Georgia, and on the south by Azerbaijan. 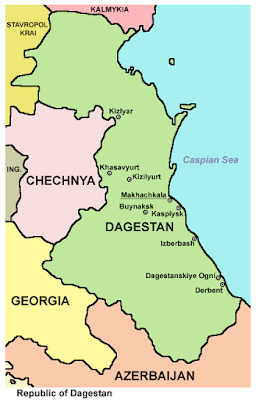 Daghestan,. 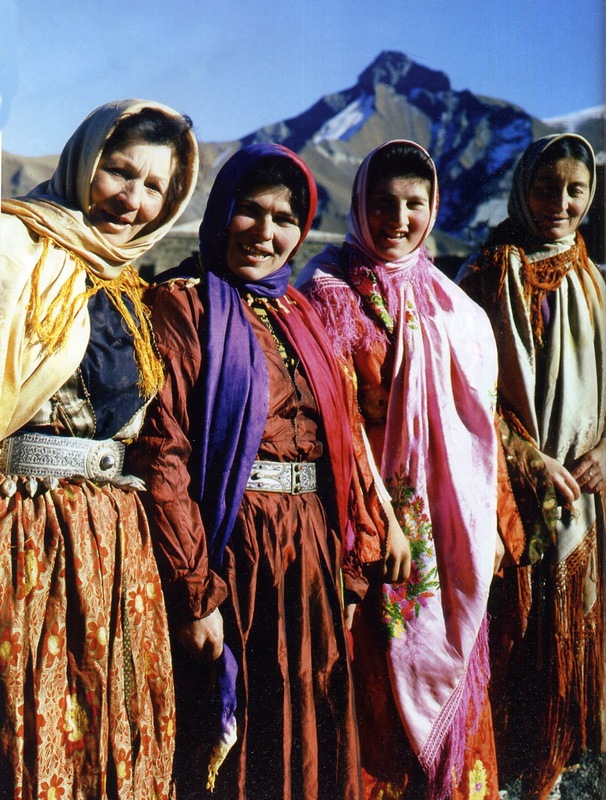 unlike most such regions, does not have a dominant ethnic group. The word itself means 'mountain land', as does the other term for this area, 'Kohistan'. 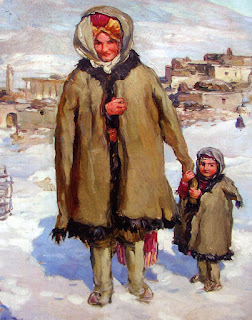 It is also unique in having few Russian settlers. 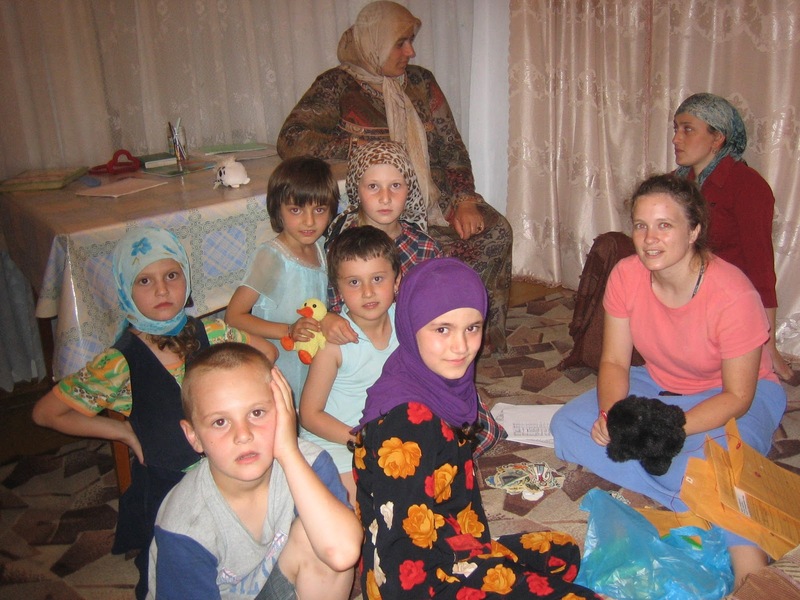 Russians form a small percentage of the inhabitants. In practical terms, a coalition of Russians, Dargins and Avars forms a majority and tends to run things politically. 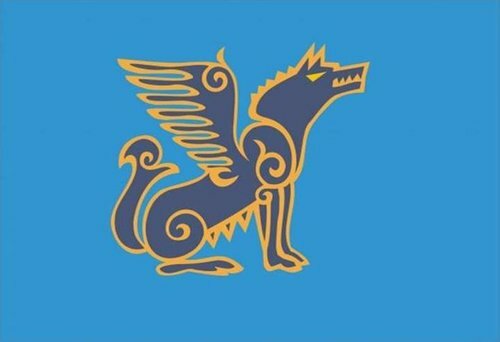 The capitol is Makhachkala, and this is the flag. 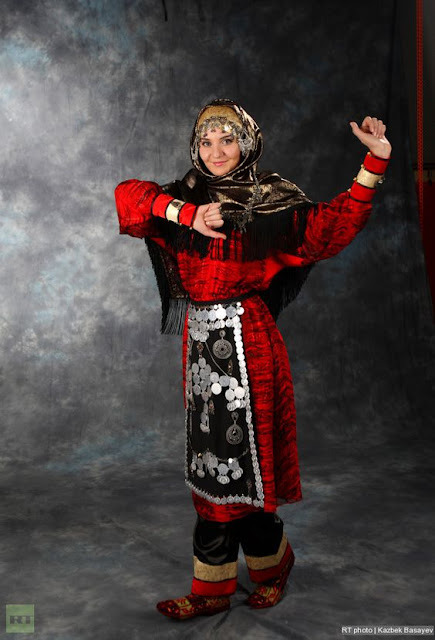 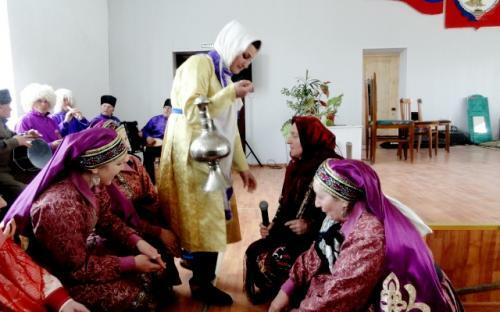 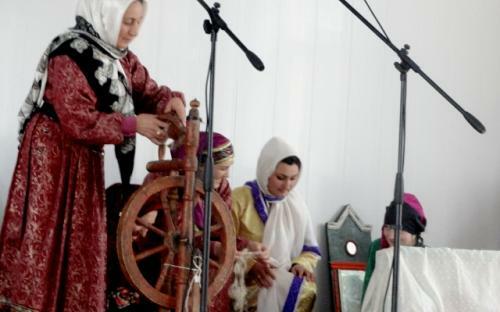 Dagestan is home to about 30 ethnic groups which speak languages belonging to three major language families. Here is a map showing the major languages and ethnic groups of Daghestan. 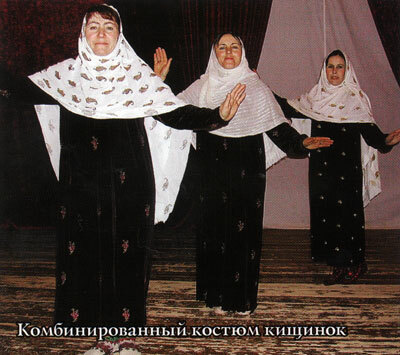 The sky blue in the north, number 26, represents the Nogay, the darker blue, 25, represents the Kumyk, the very pale blue on the coast in the south, number 22, represents the Azeri. These all speak Turkic languages. The pale green in the north, number 21, represents the Russians, there is also a very small Tat enclave in the south of Dagestan . These speak Indo-European languages. 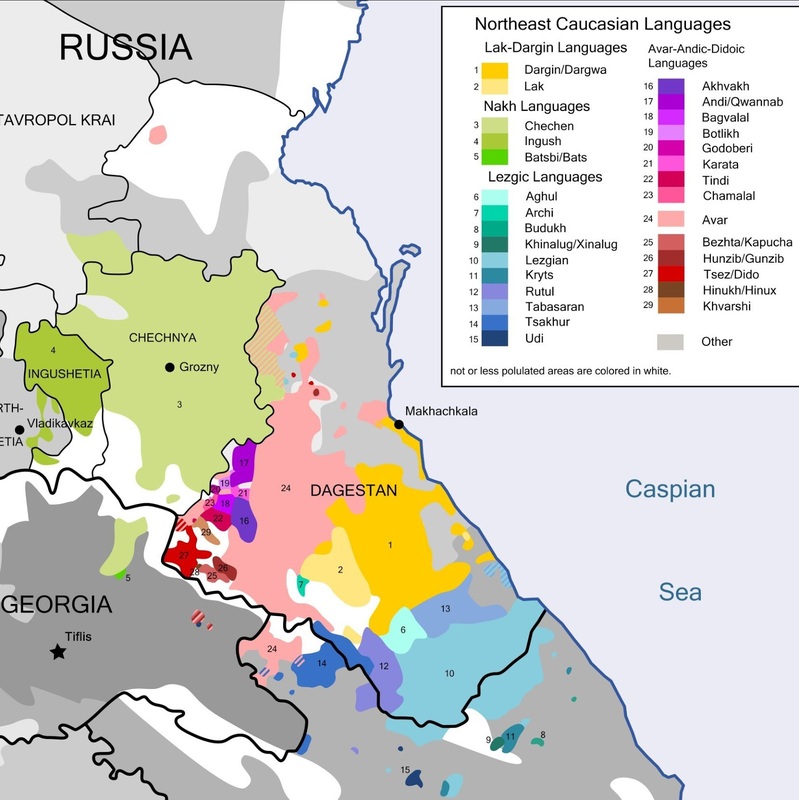 The rest of the peoples shown on the map speak languages of the Dagestan or East Caucasian language family. 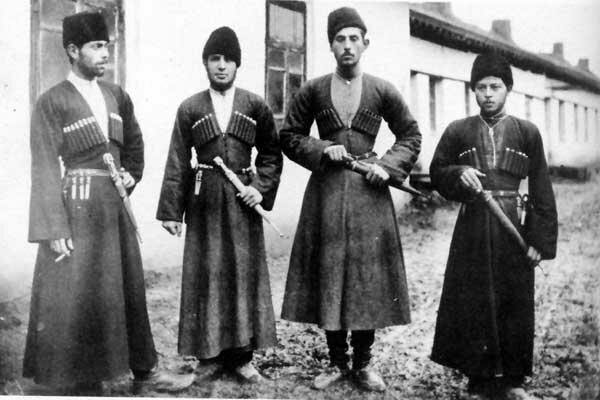 Only the major ones are shown here: 6 Agul, 7 Avar, 8 Dargin, 9 Lak, 10 Lezgin, 11 Rutul, 12 Tabasaran, 13 Tsakhur, 14 Chechen, 15 Ingush. 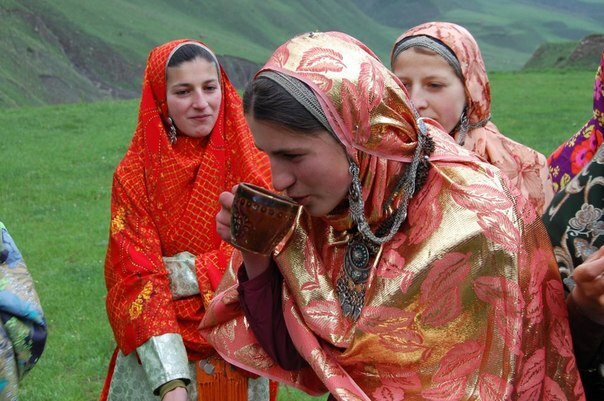 Linguistically, these languages are amazingly complex and extremely rich in consonants. 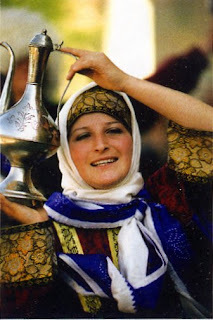 Information is not easy to find on these peoples, but I will present what I have. 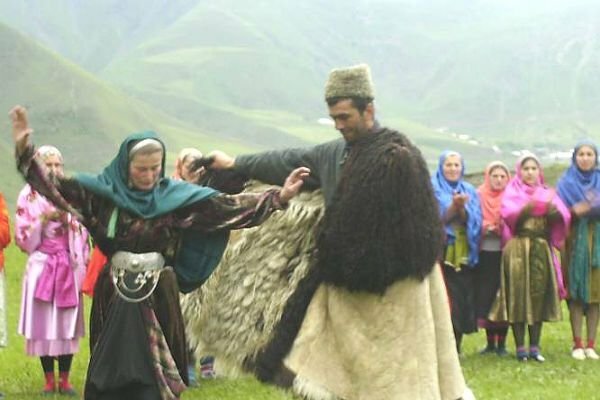 I will not cover the Russians, Chechens, Tat or Azeri, as all of these have their main population beyond the borders of Dagestan. 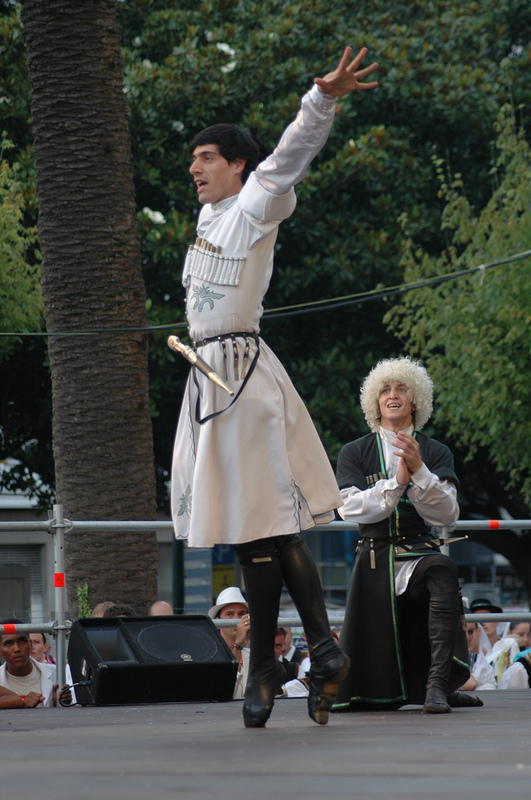 Men's costumes of the region are not distinguishable between the various ethnic groups. 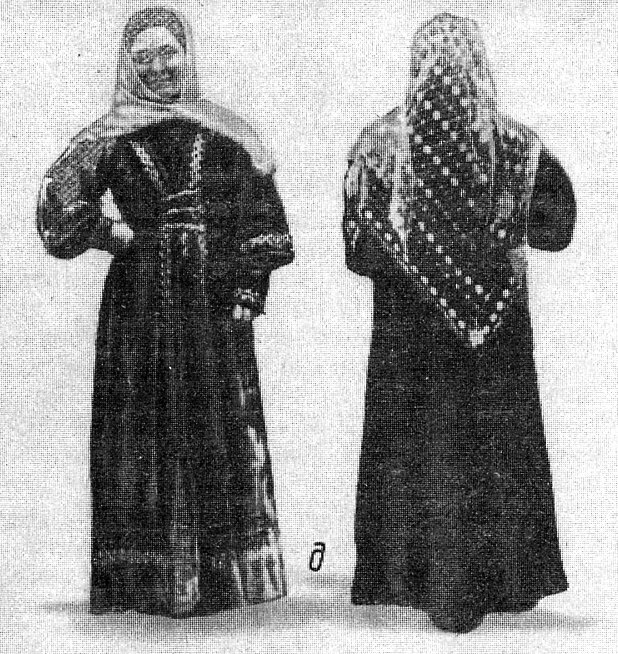 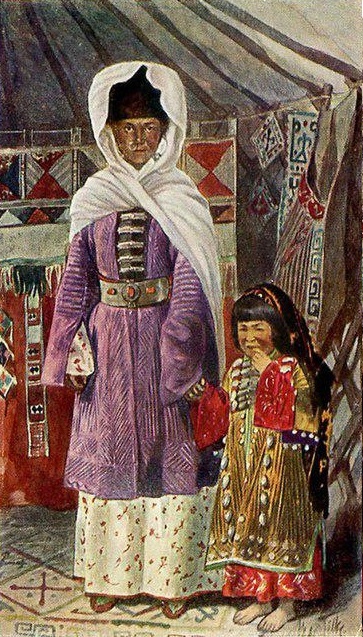 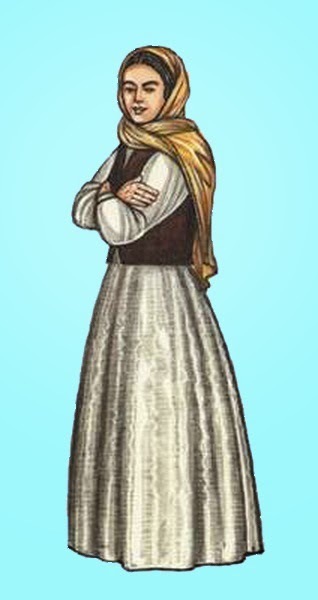 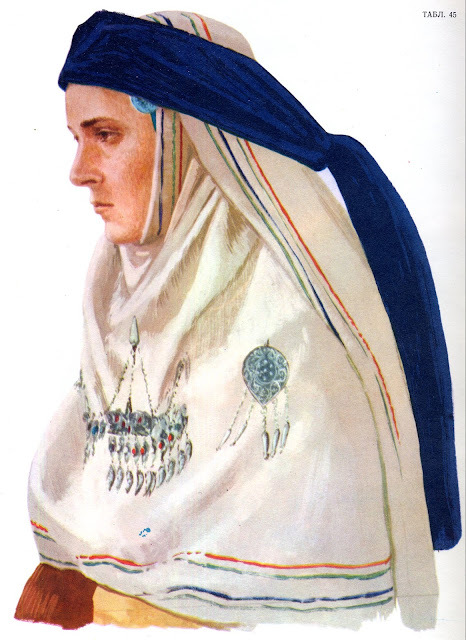 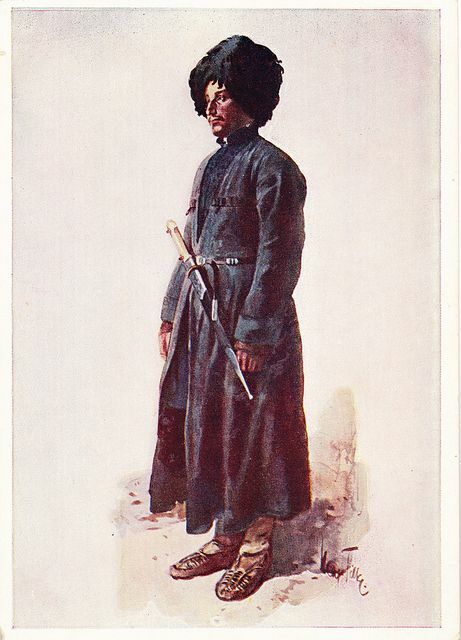 The image at the head of this article shows a man dressed in typical Caucasian garb, with beshmet and cherkesska. 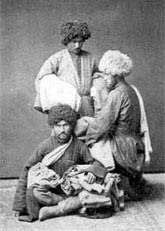 I will provide images of men within the groups when I have evidence that they belong there. 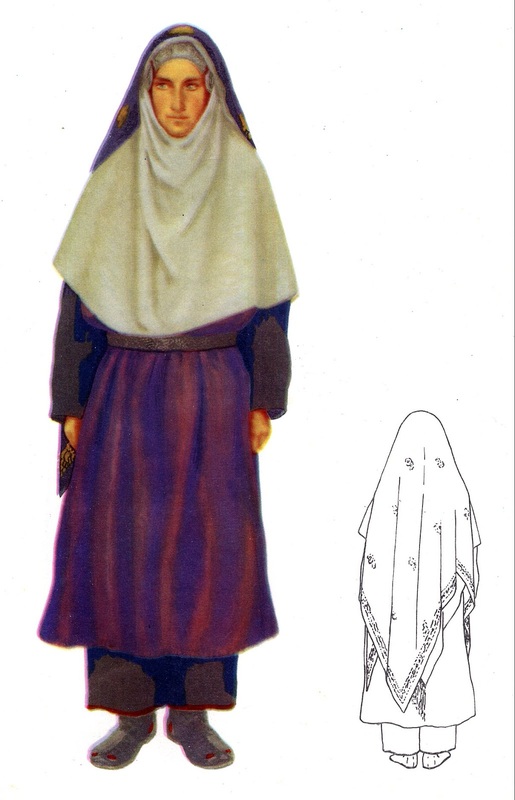 They cannot be distinguished by appearance. 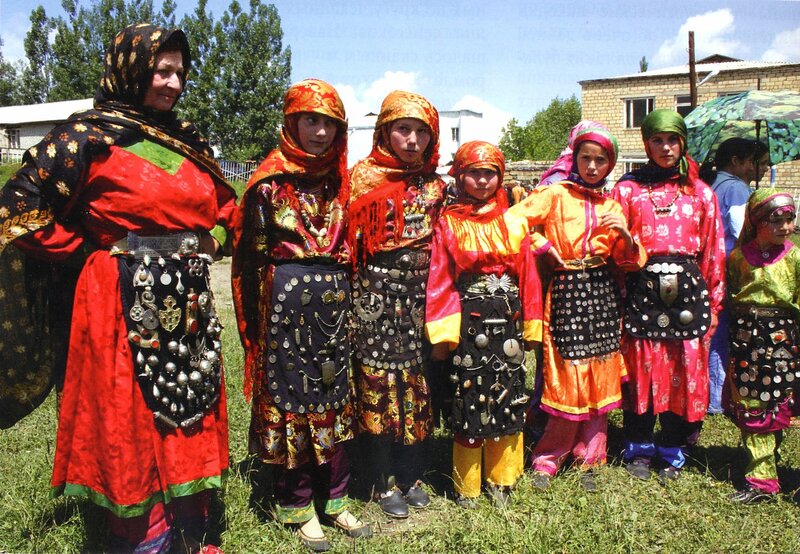 The Turkic peoples have their origin in Central Asia, and migrated to this area starting about the year 1000. 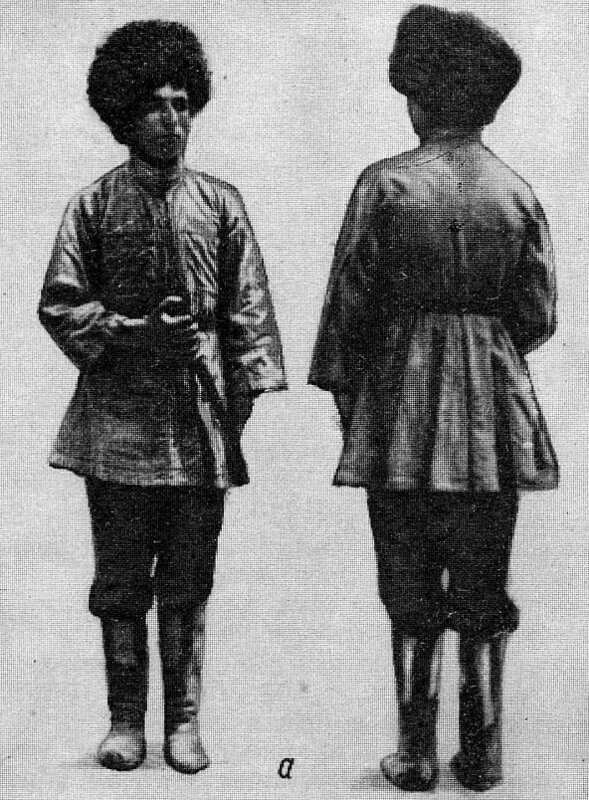 Both of the ones found in Dagestan are of the Kipchak branch. 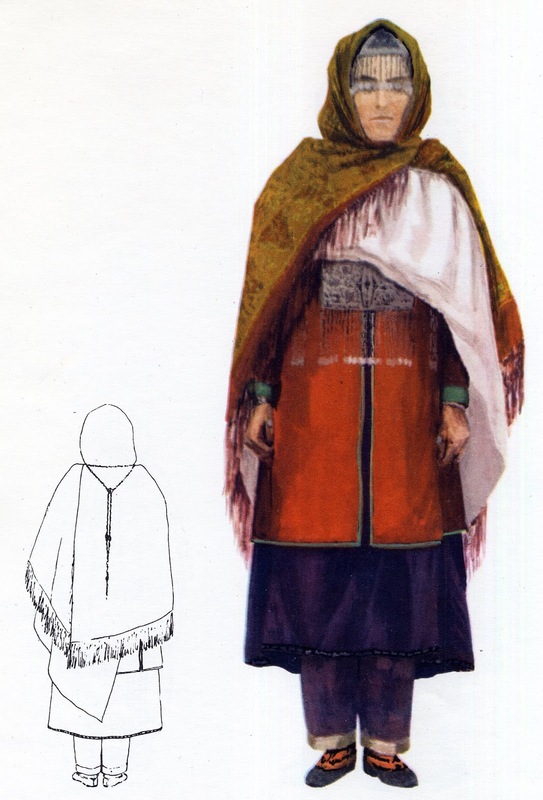 They inhabit the north and the lower altitudes along the coast. 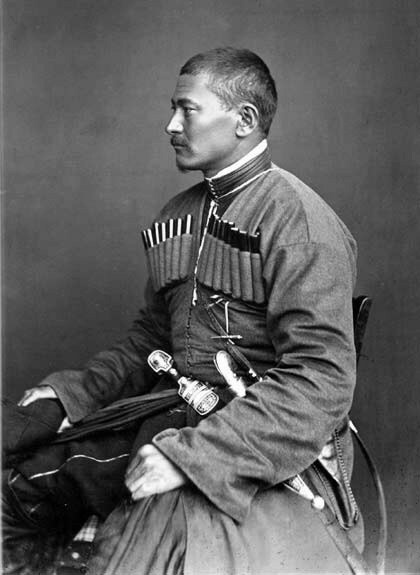 The Nogai are the most recent arrivals of the various peoples in this area, [not counting the Russians], They are of mixed Turkic and Mongolian stock, and traditionally lived a semi nomadic lifestyle on the steppes. 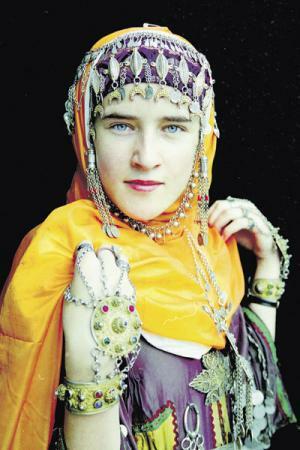 They formerly lived in yurts, and are also found to the west and the north of Dagestan. 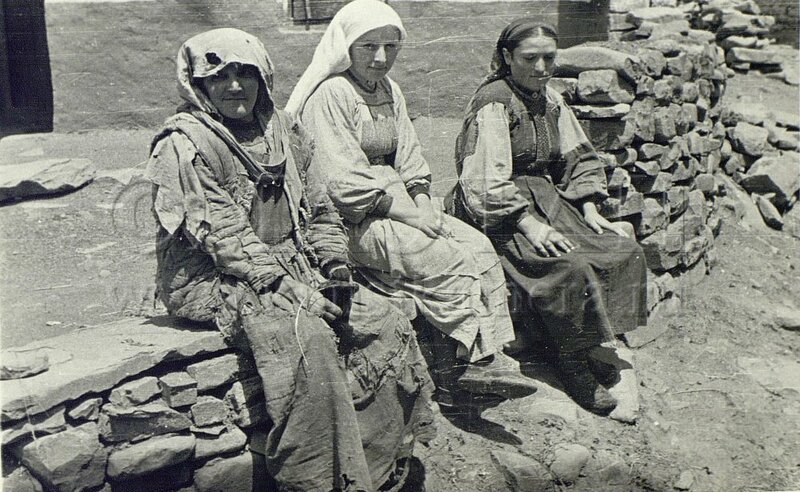 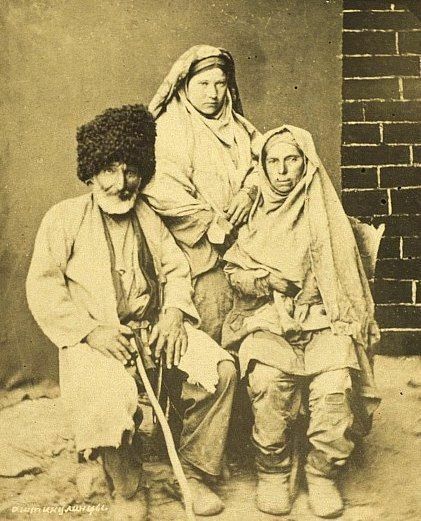 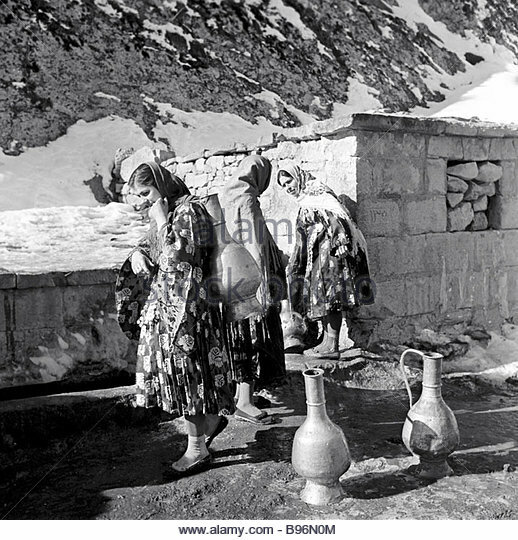 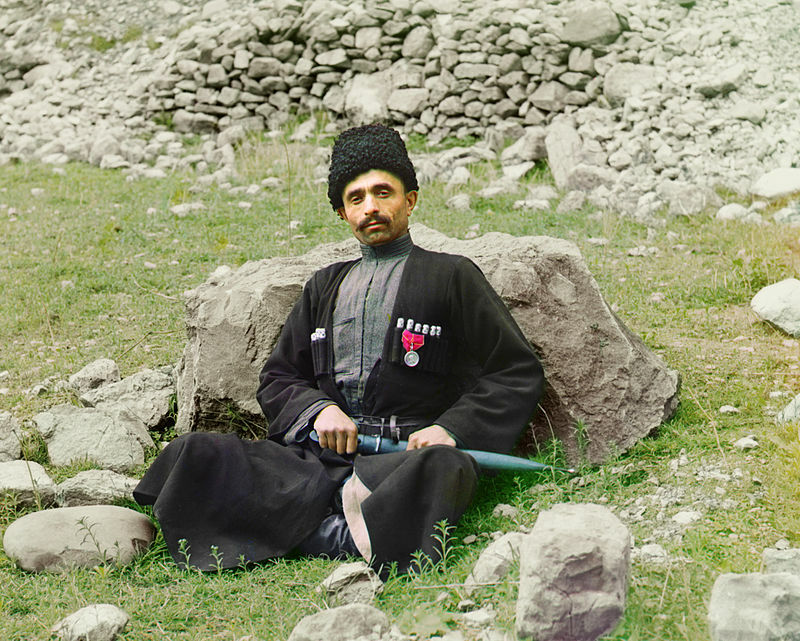 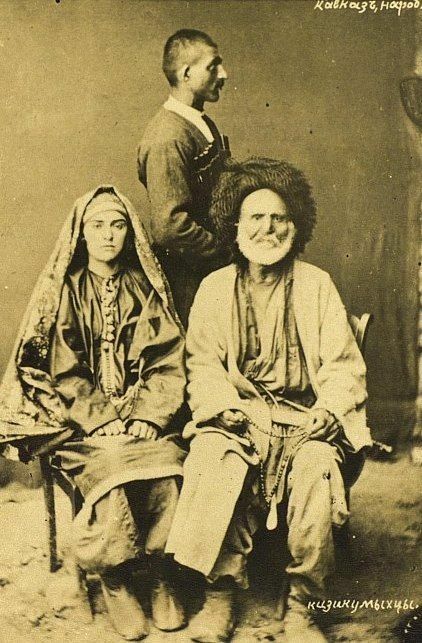 They were apparently forced into Dagestan by conflicts with the Russians and the Kalmuk.They inhabit the low-lying areas in the north of Dagestan. 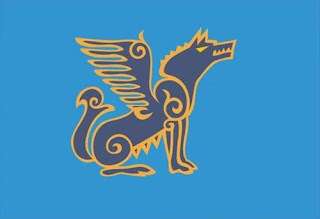 Their symbol is the winged wolf. Two notable aspects of Nogai costume are the large circular headdress of the married women, and the short jacket which is embellished with quilting and metal ornaments. 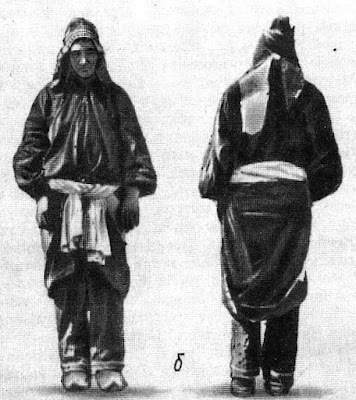 The Kumyk inhabit somewhat higher ground than the Nogay, living on a plateau. 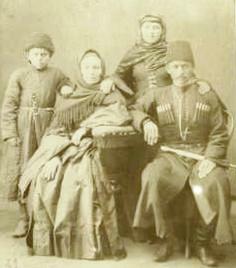 They may possibly be descendants of the Khazars. 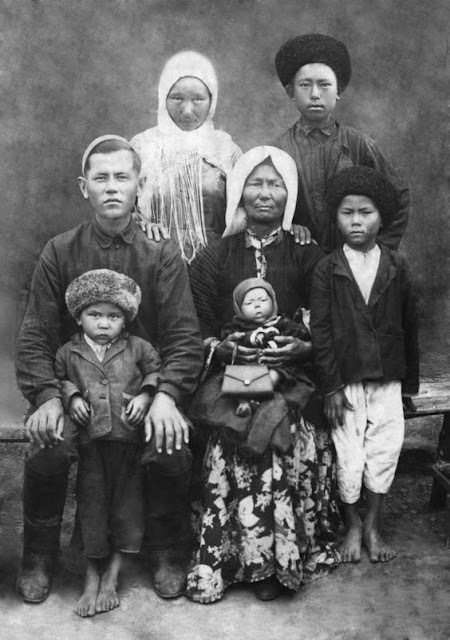 They range along a significant part of the coast, and are slowly assimilating the indigenous people to the south of them. 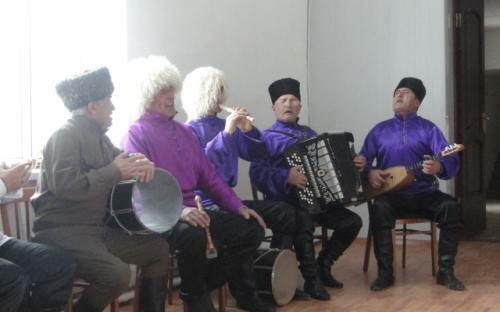 They arrived in the area earlier than the Nogay. 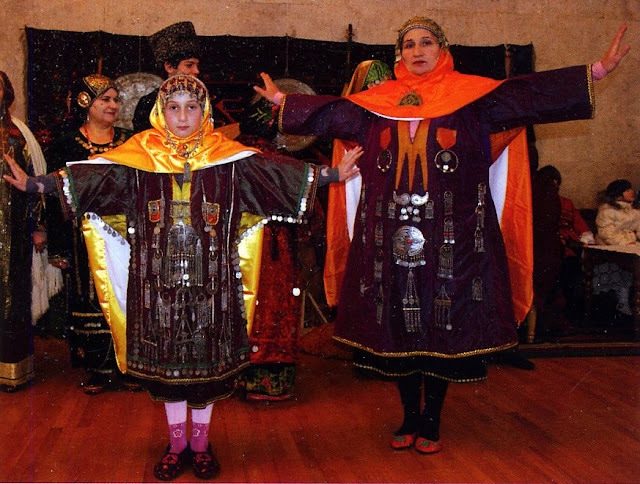 The language is closely related to Karachay and Balkar, which are spoken further west in the Caucuses, on the southern edge of Circassia. The costume is of the basic aristocratic Caucasian type, with long skirt and overdress. 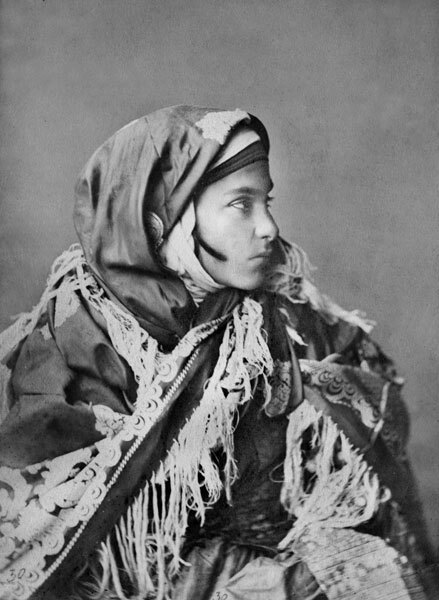 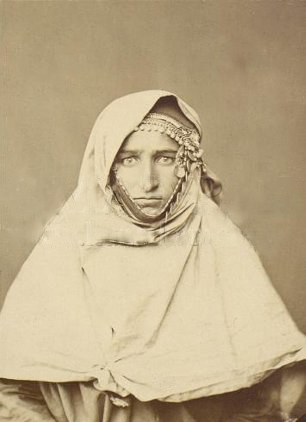 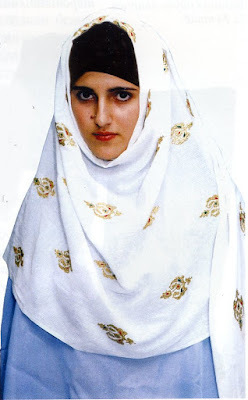 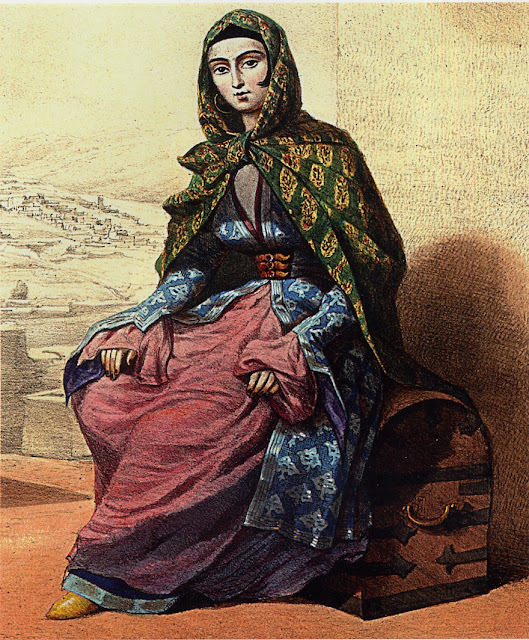 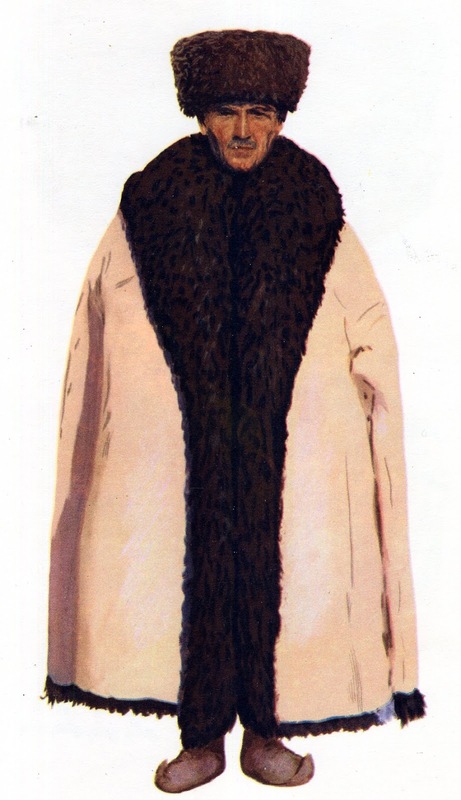 A large scarf is wrapped around the head. 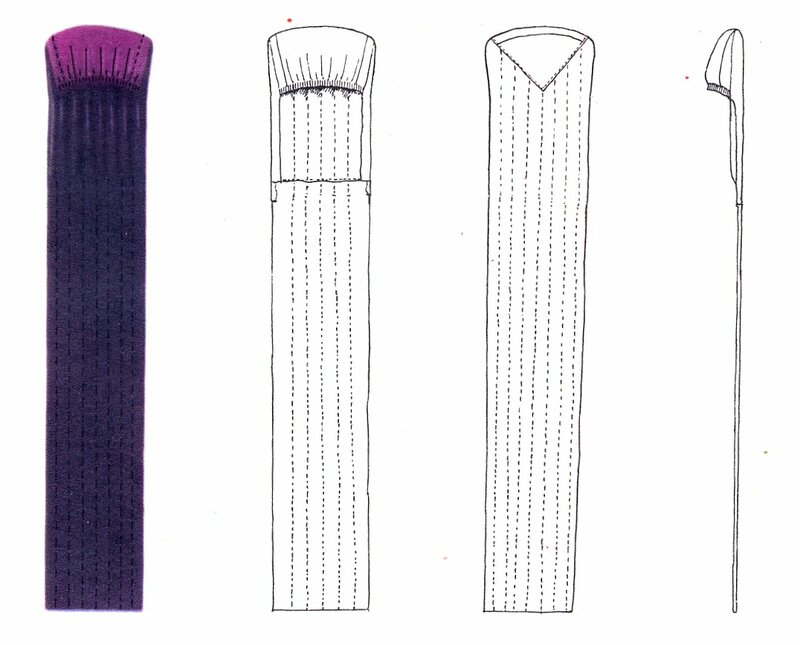 Winged sleeves are also sometimes found. 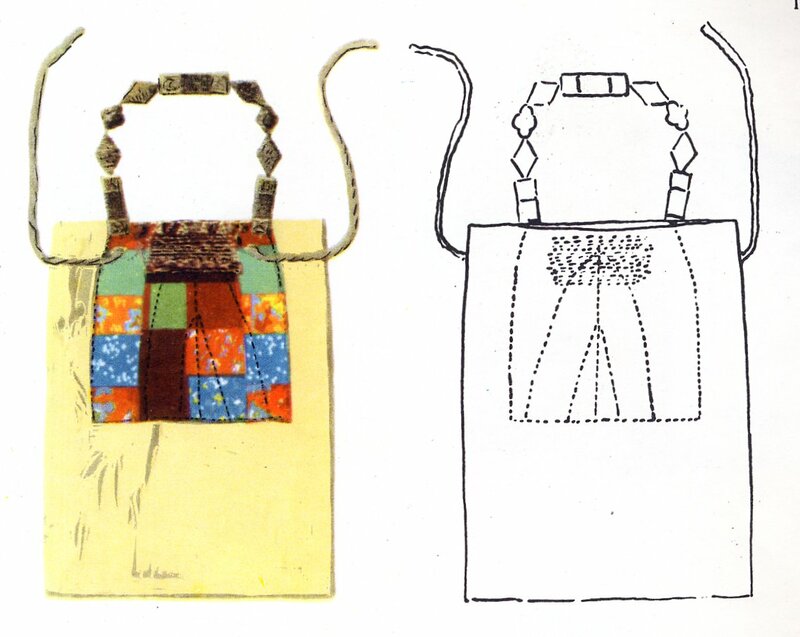 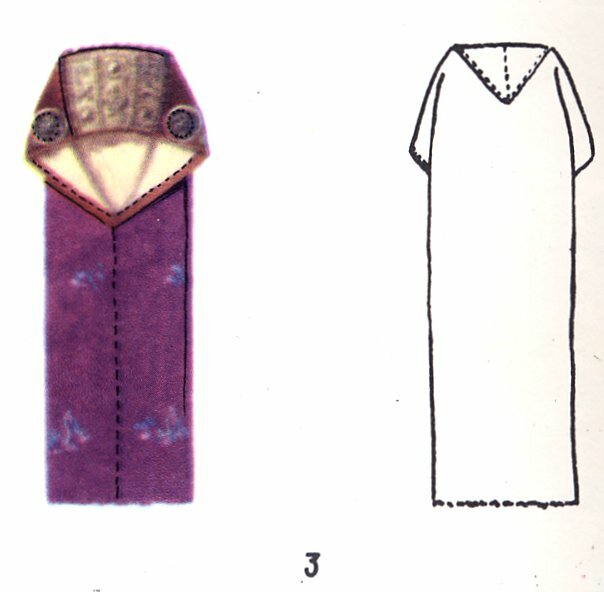 Commonly the bodice has rows of horizontal ornament. 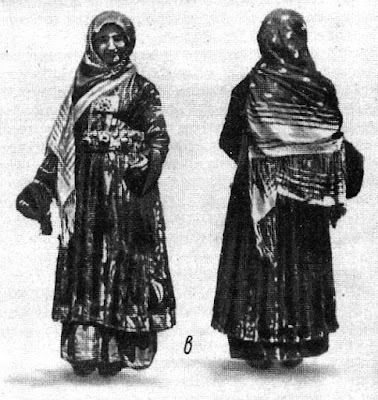 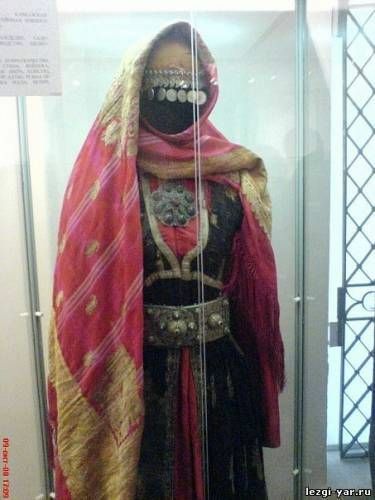 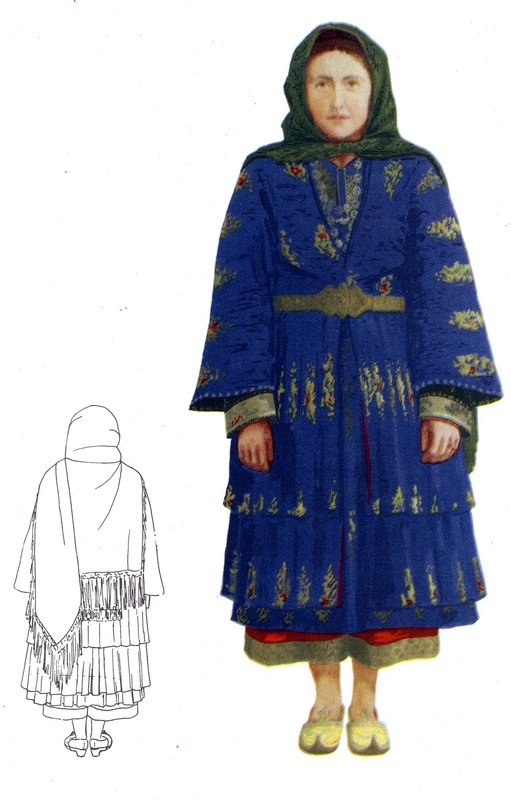 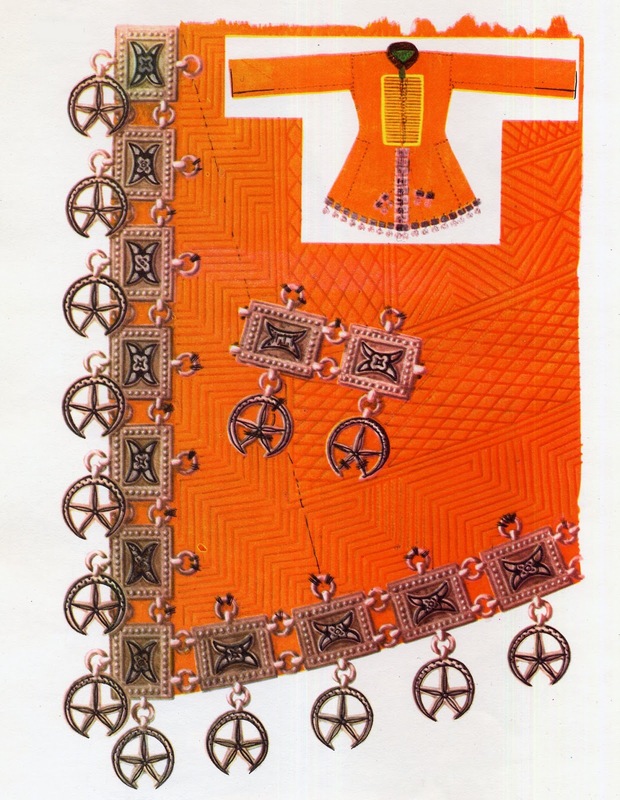 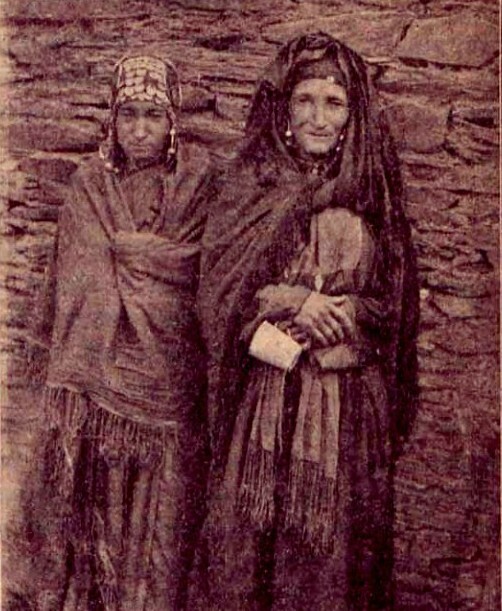 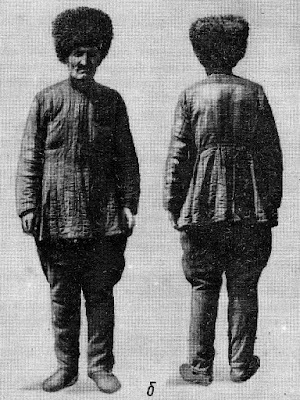 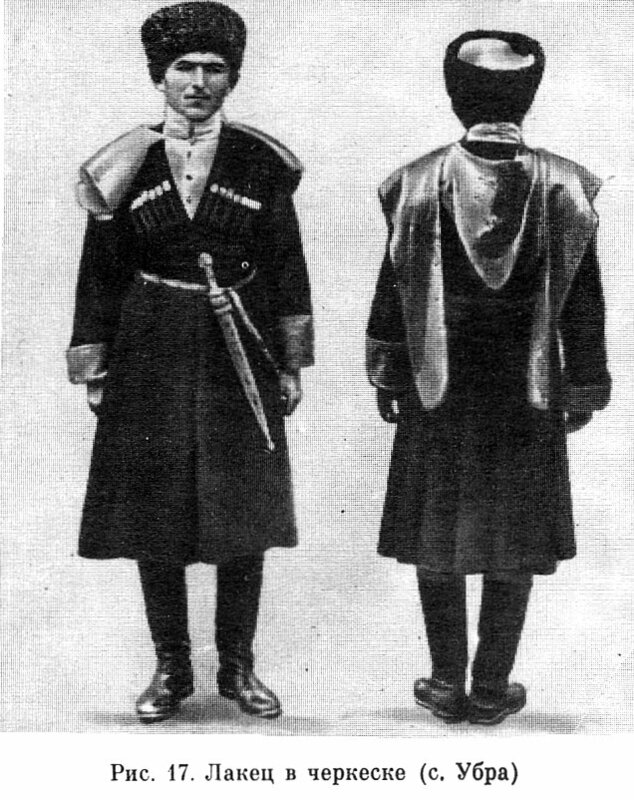 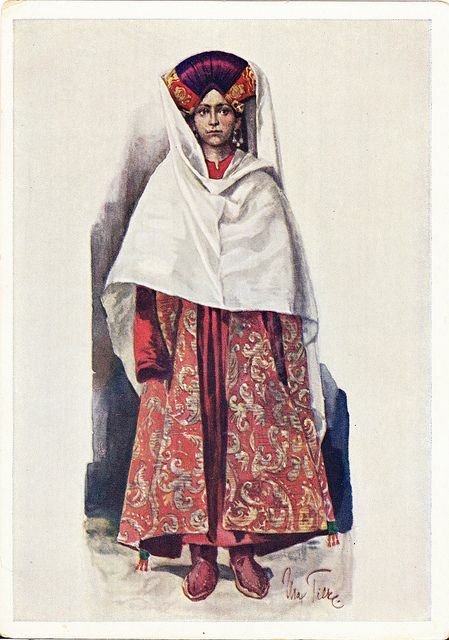 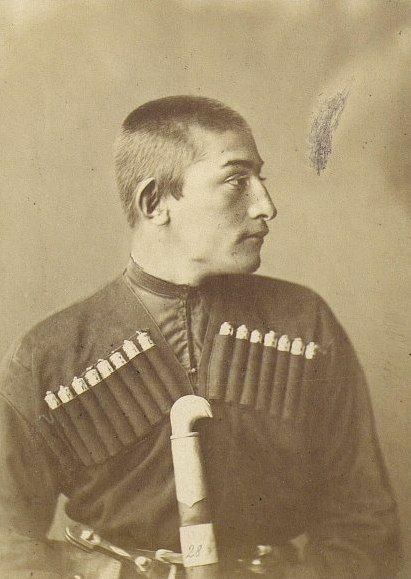 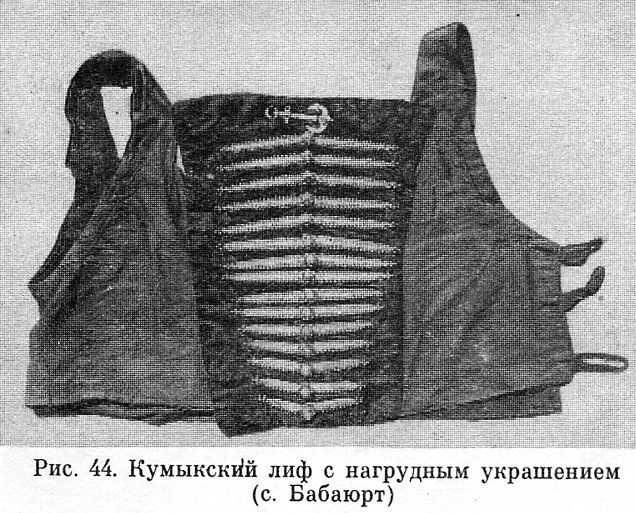 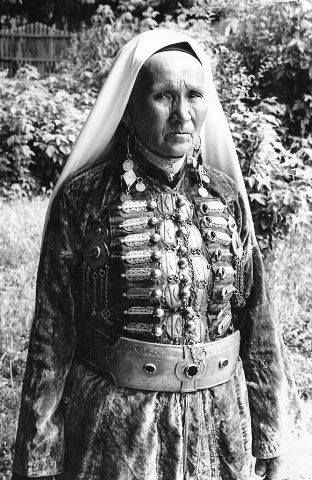 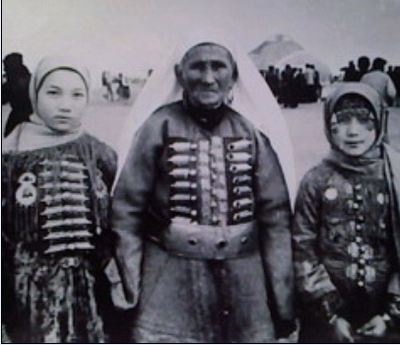 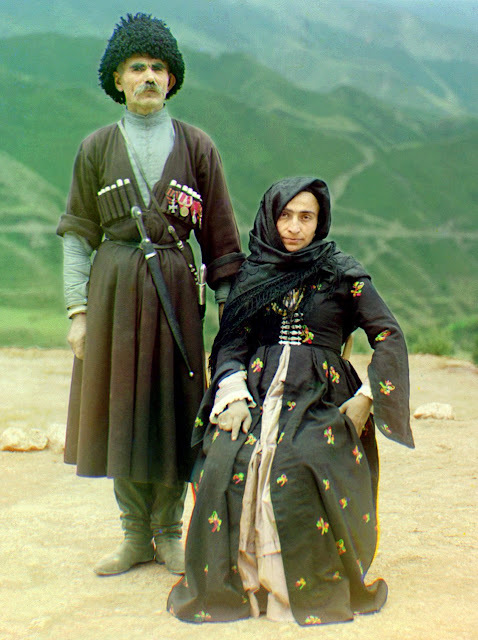 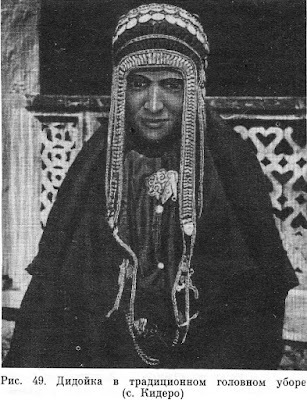 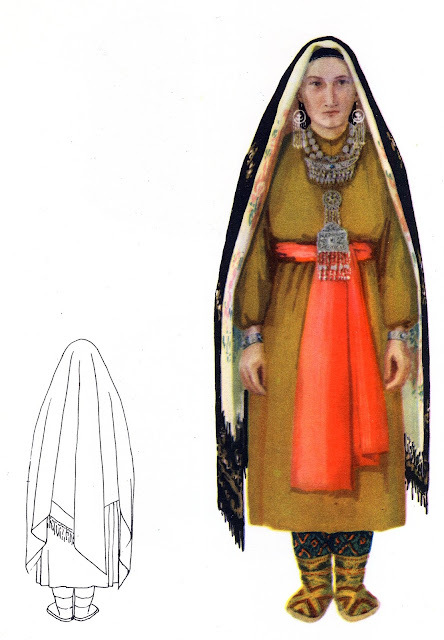 The costume is also similar to those of the Karachay and Balkar. These inhabit a rectangular zone that consists of Central and Southern Dagestan. There are several branches of this language family. 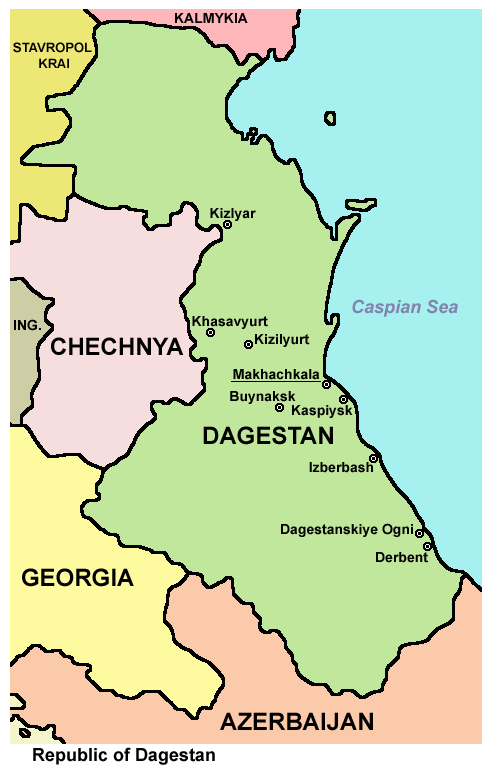 Two of these branches, the Nakh languages [Chechen, Ingush and Bats], and Khinalug, [an isolate spoken in northern Azerbaijan], are spoken outside the borders of Dagestan, although there are some Chechens who live on the Dagestani side of that border. 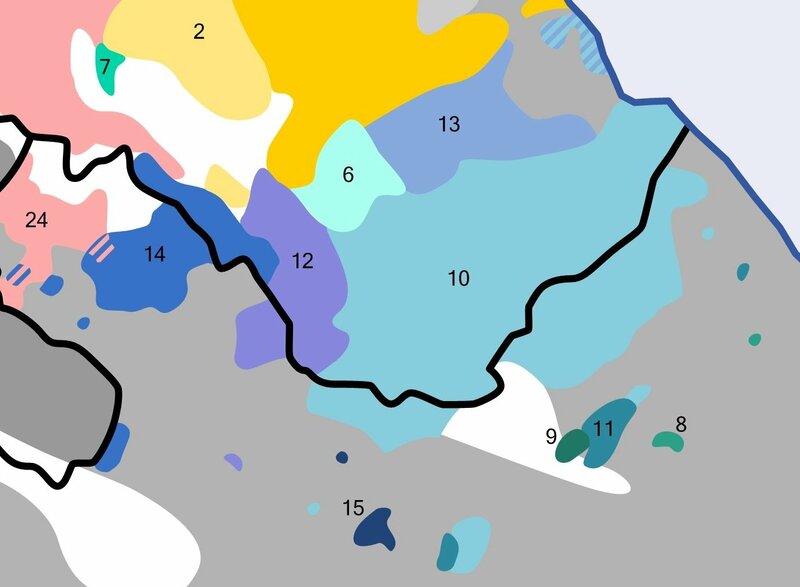 Here is a map showing all of these various languages. Languages that are not of this family are shown in shades of gray. These peoples fall rather naturally into 3 zones. 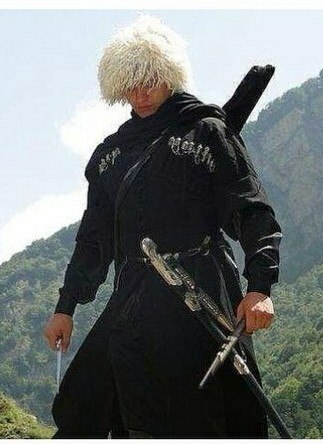 I will cover them from north to south. 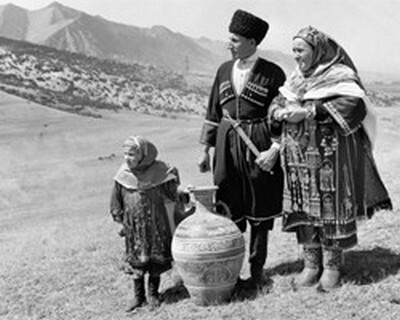 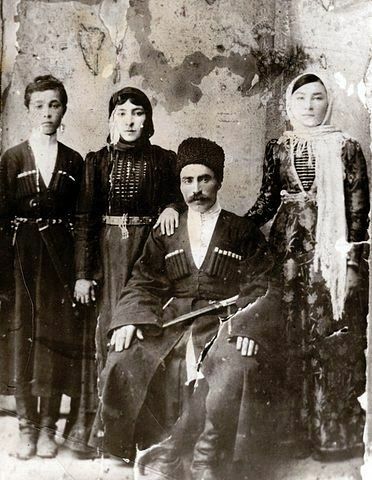 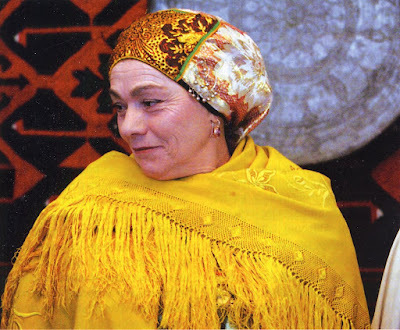 The Avaral are one of the most widespread people of Dagestan, number 24 on the map above. 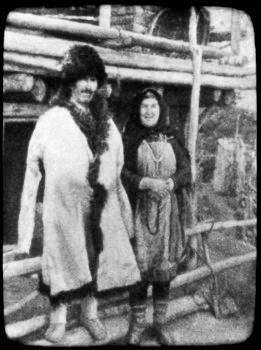 The language was originally also spoken further north, but has lost ground to Kumyk. 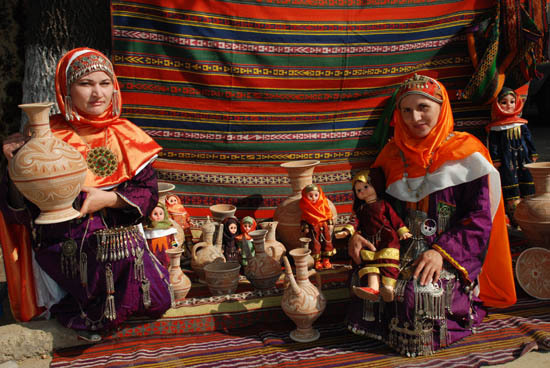 The language has various dialects, but none of them have been broken out into separate languages. 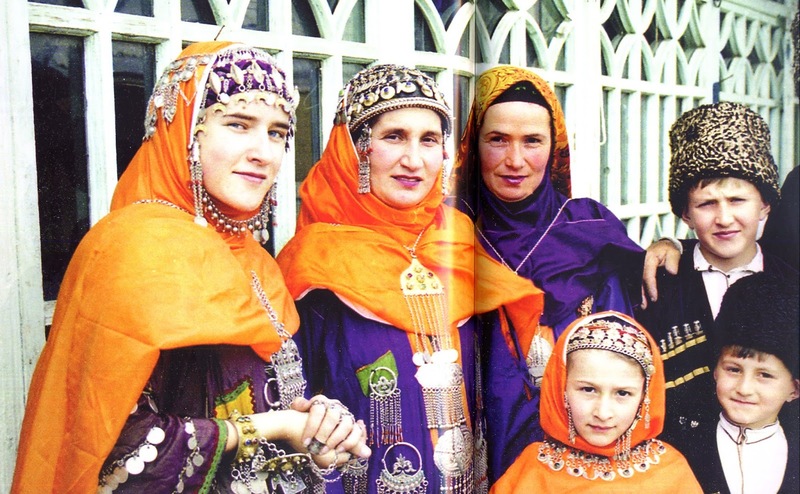 They are not related to other groups in history which are called Avars. 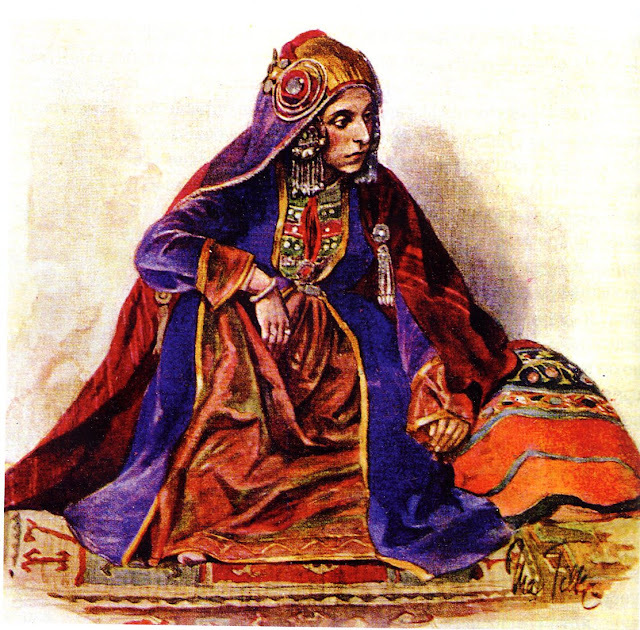 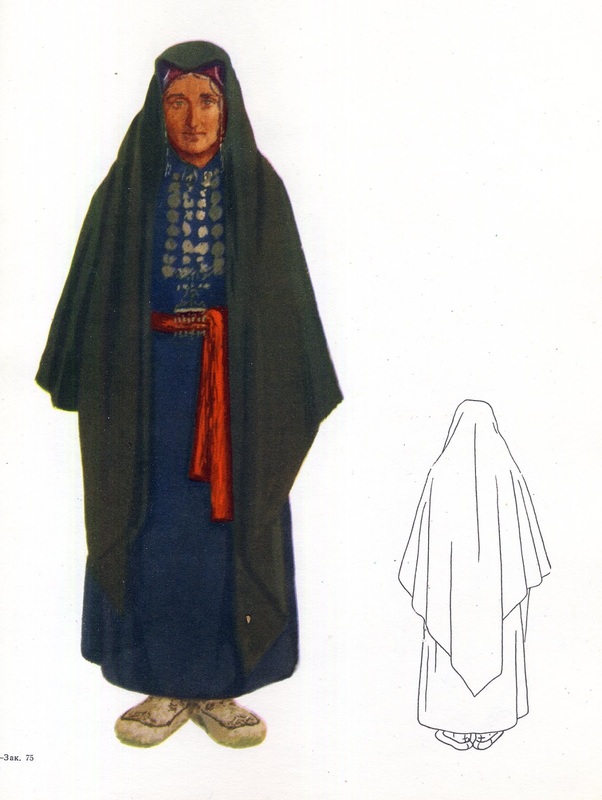 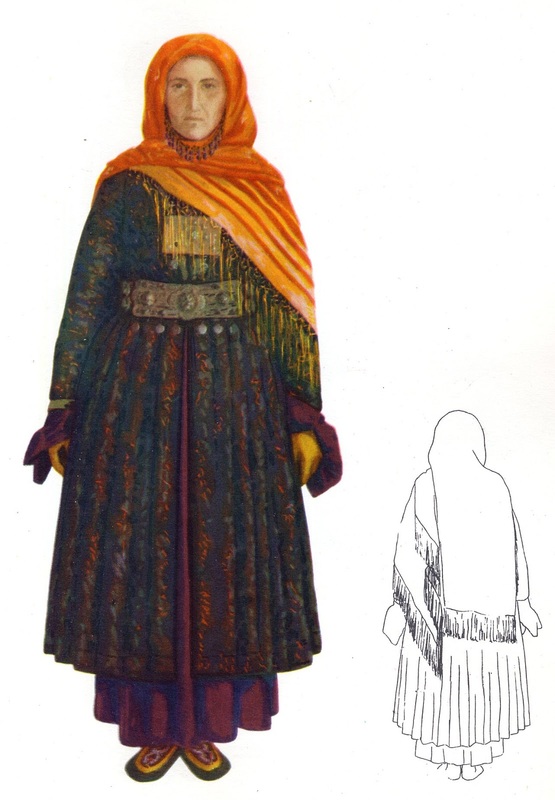 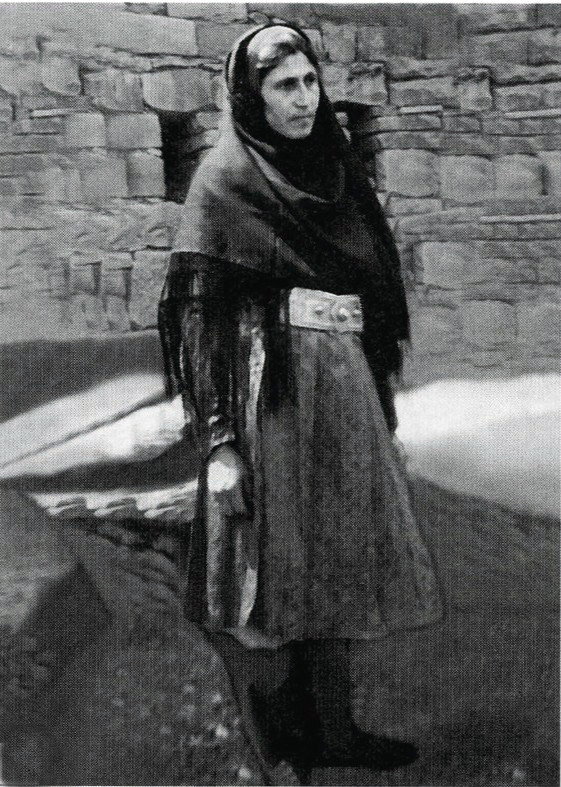 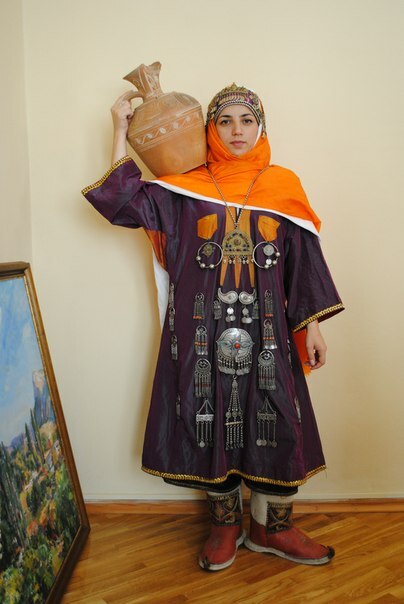 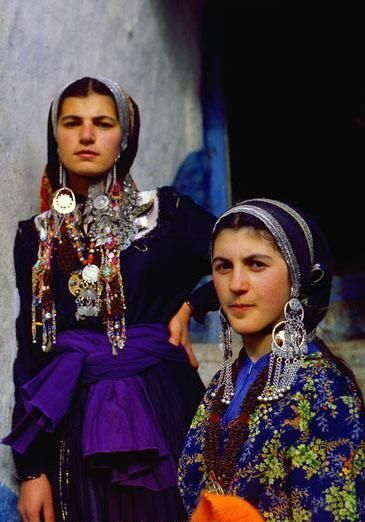 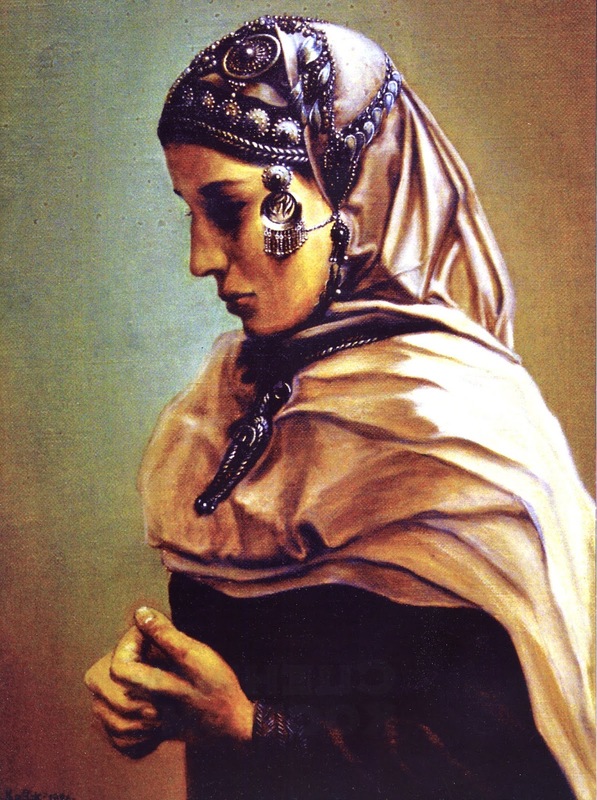 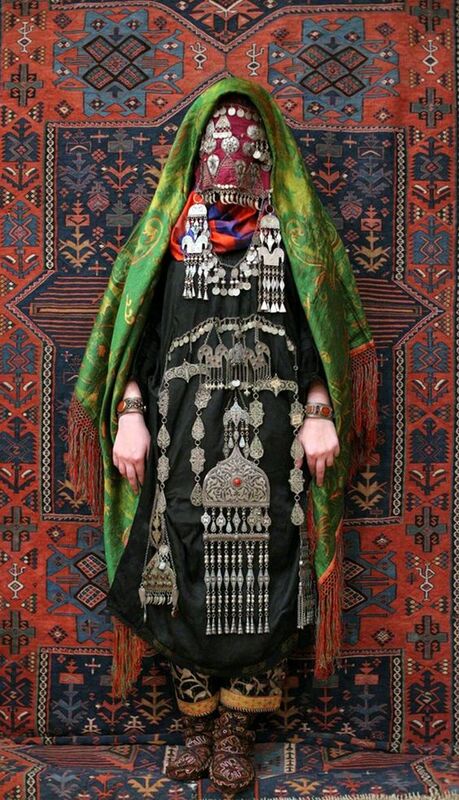 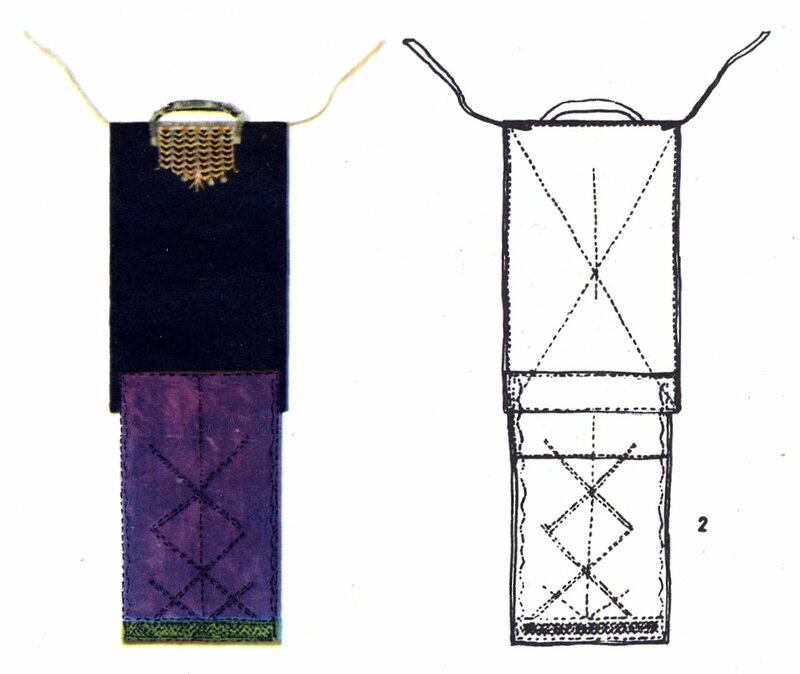 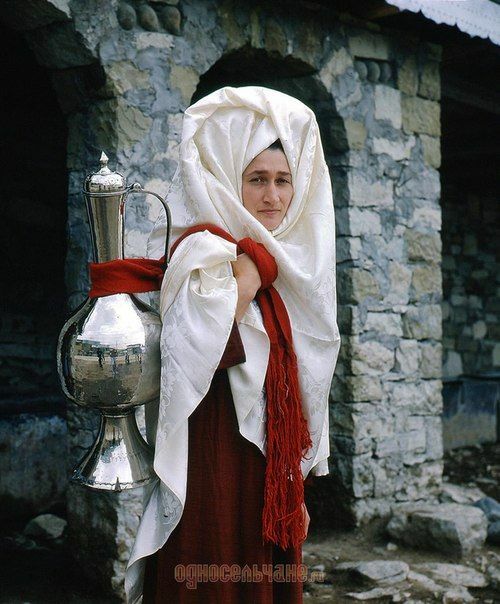 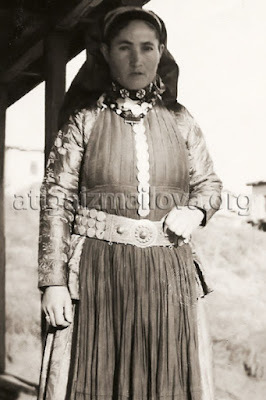 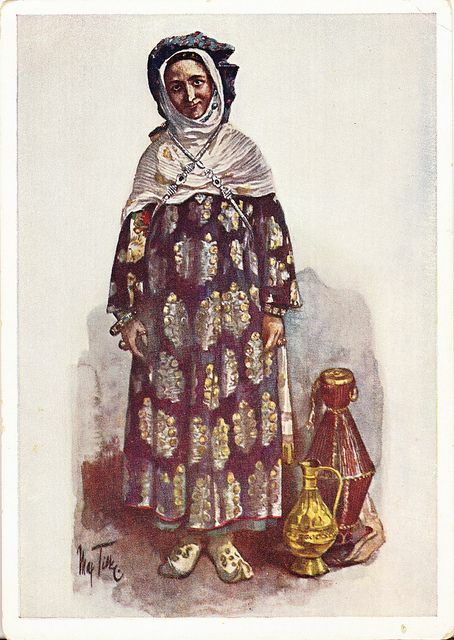 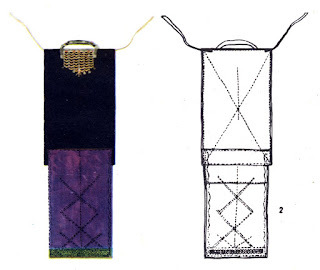 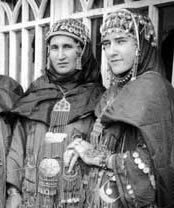 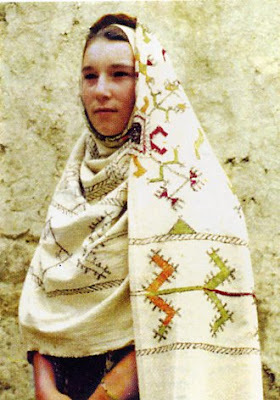 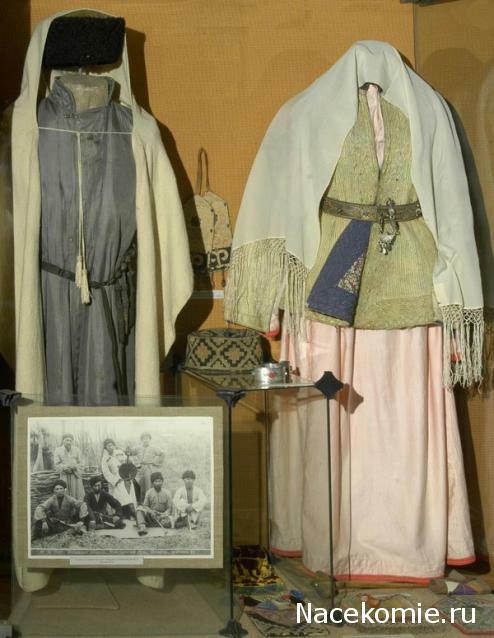 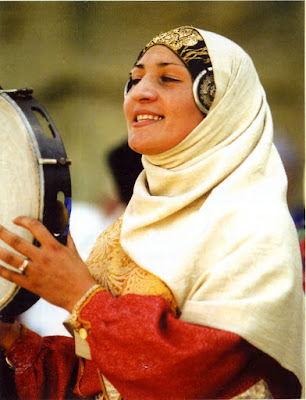 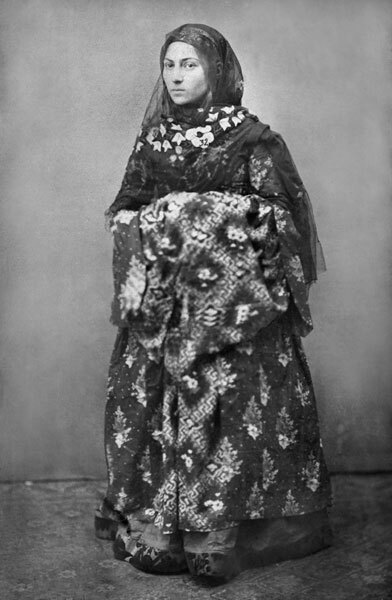 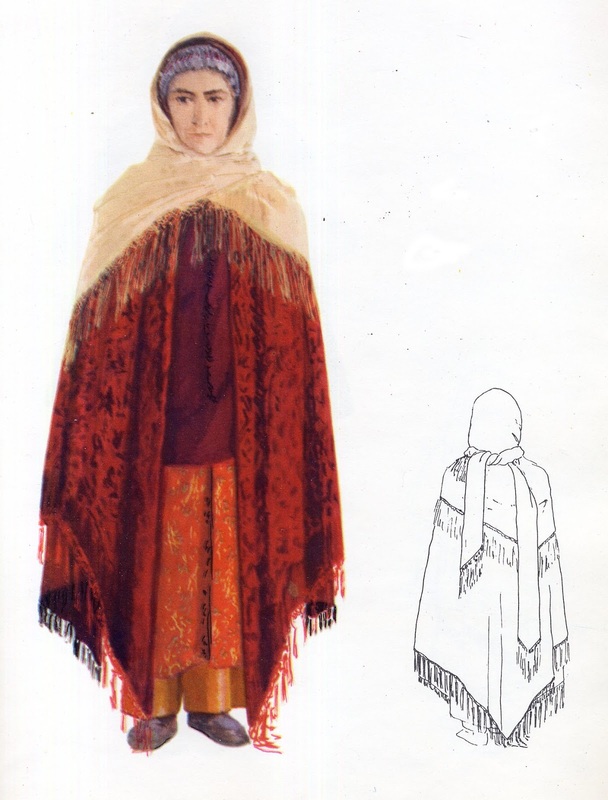 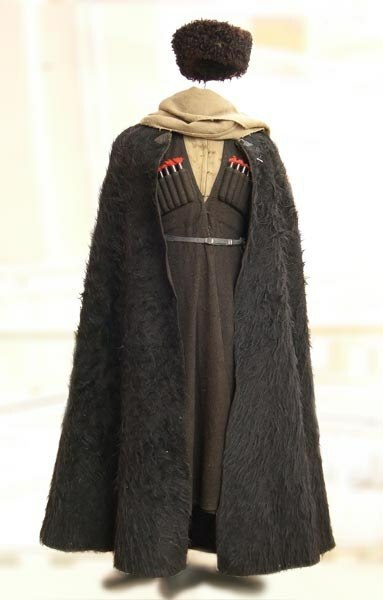 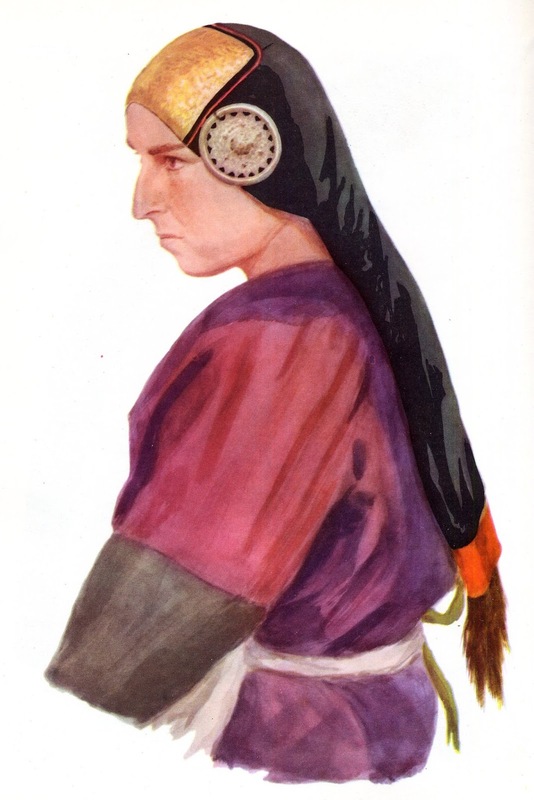 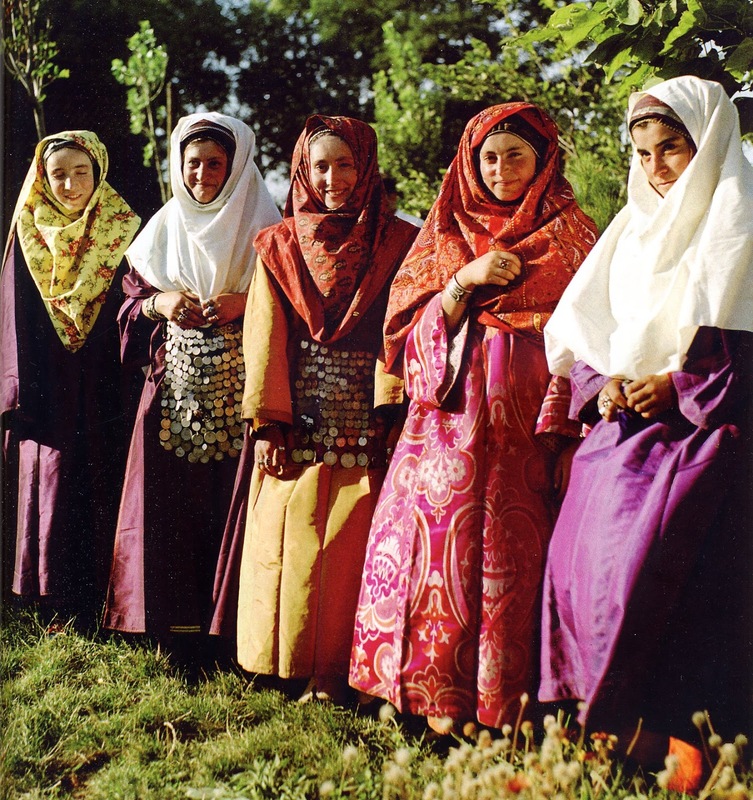 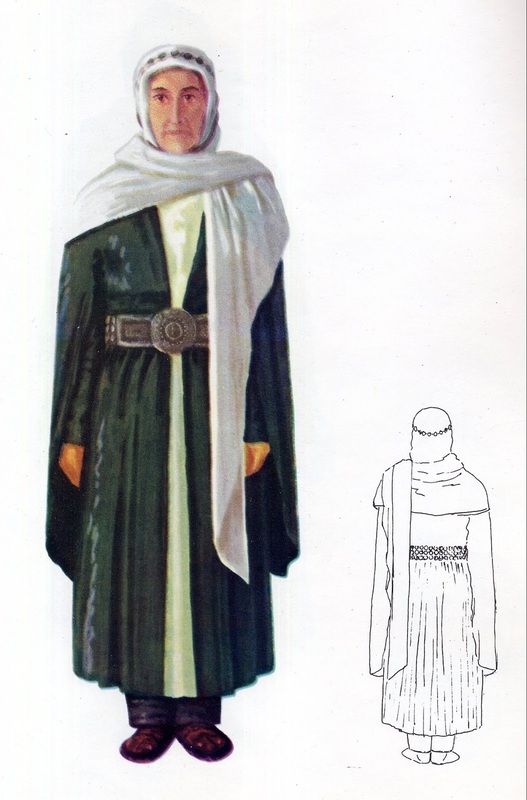 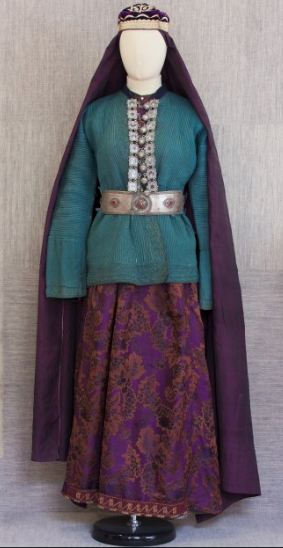 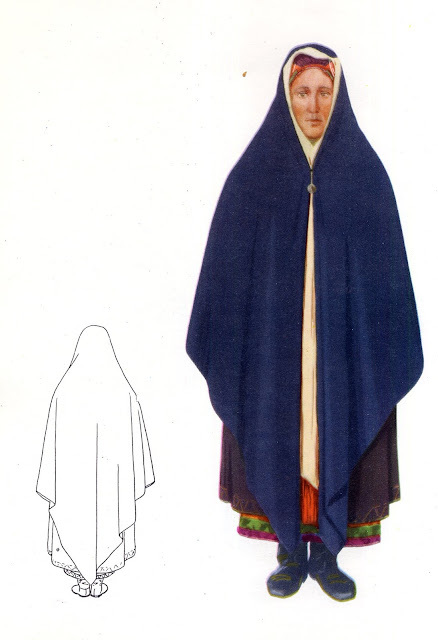 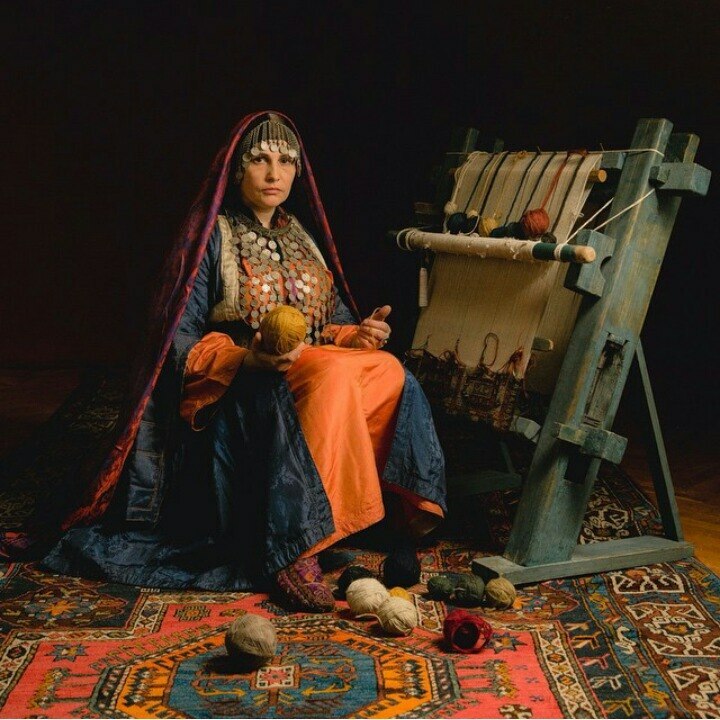 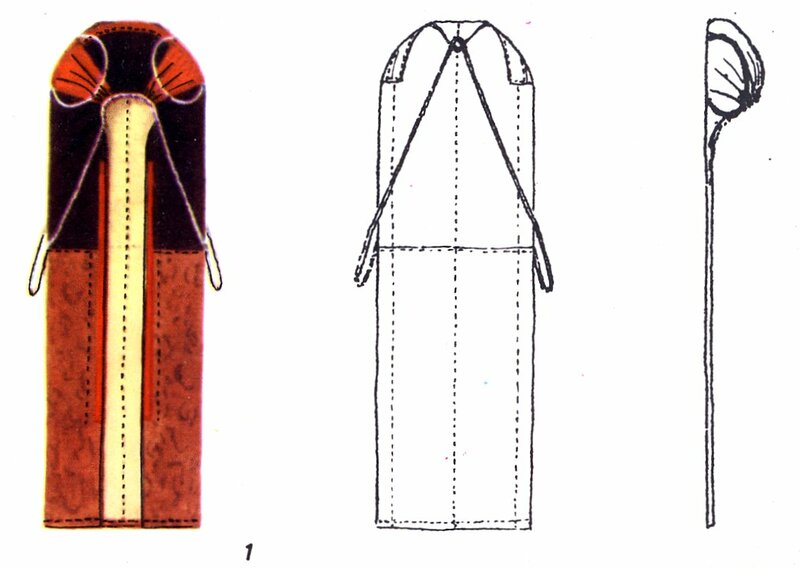 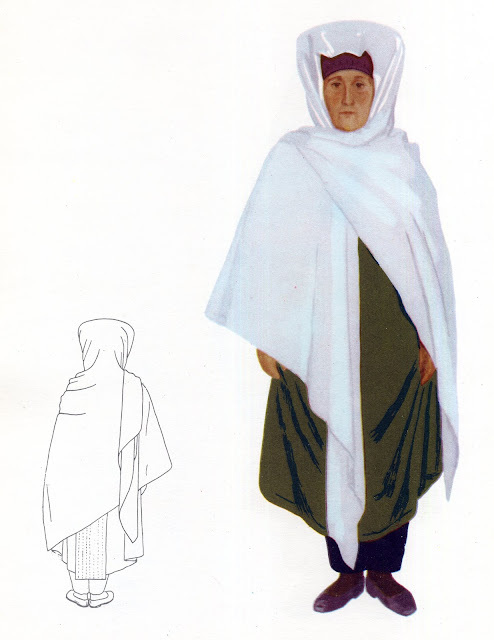 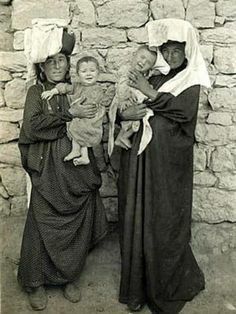 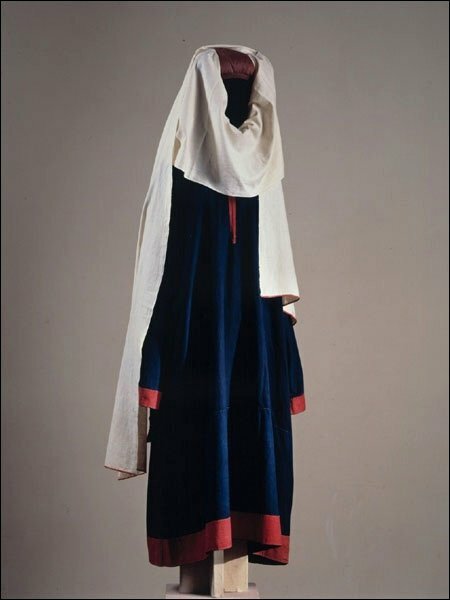 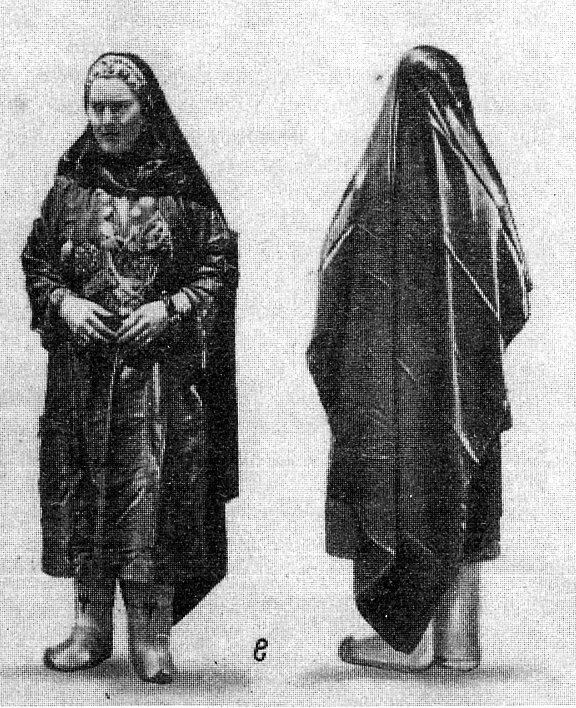 There is some variation in the Avar costume, but generally it consists of pants, a loose tunic/dress, a headdress which includes a fabric tube to hold the hair, a large shawl worn over the head, and jewelry. 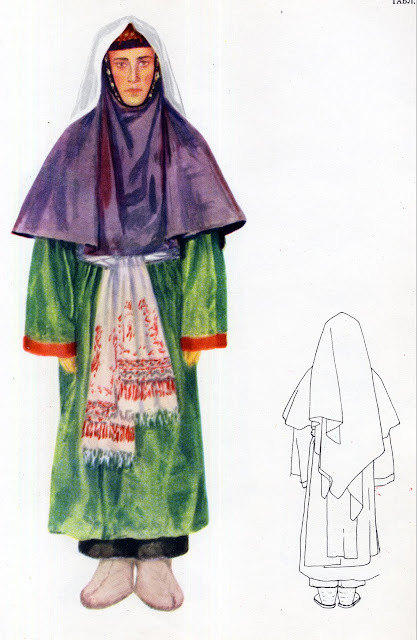 This general type of costume is found all over both the northern and the central zones. 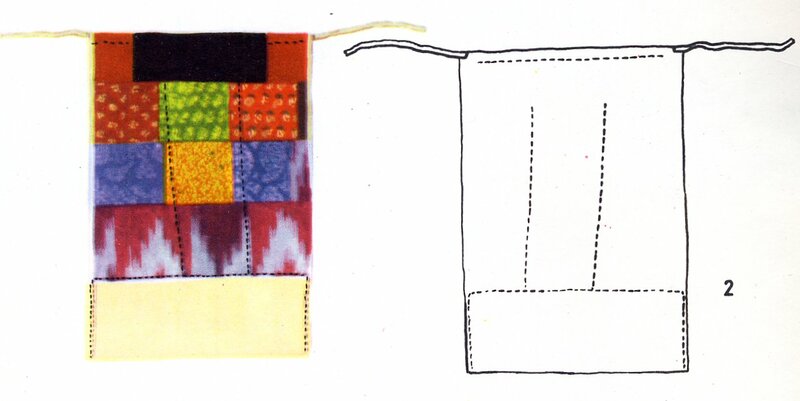 colorful knitted boots may be worn with this. 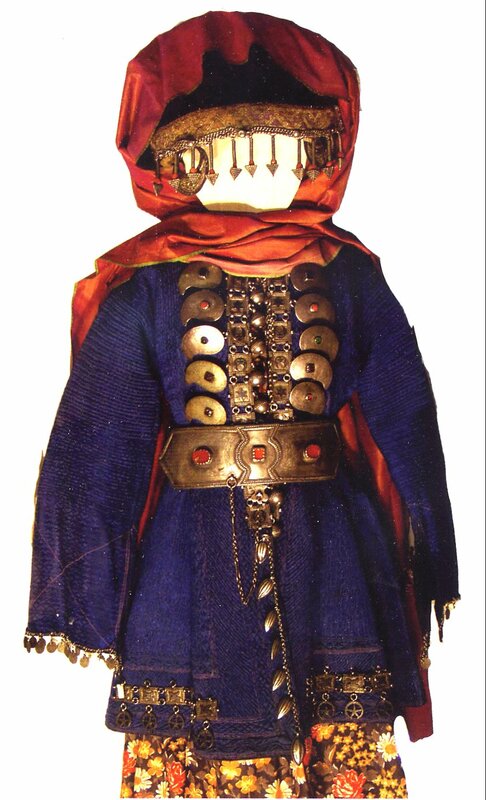 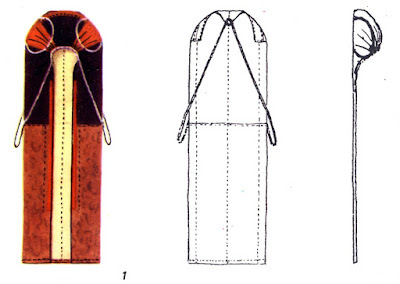 The costume of the villages of Gochob and Tliarosh are particularly practical. 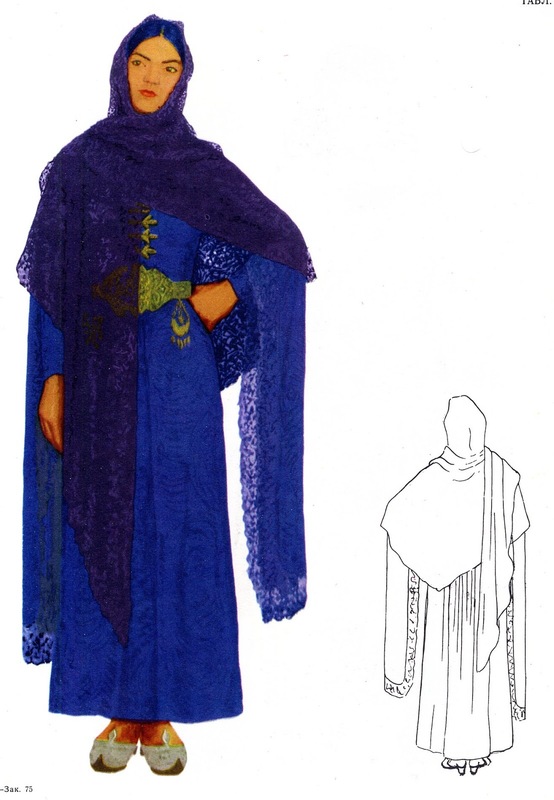 The Gidatli speak a distinct dialect. 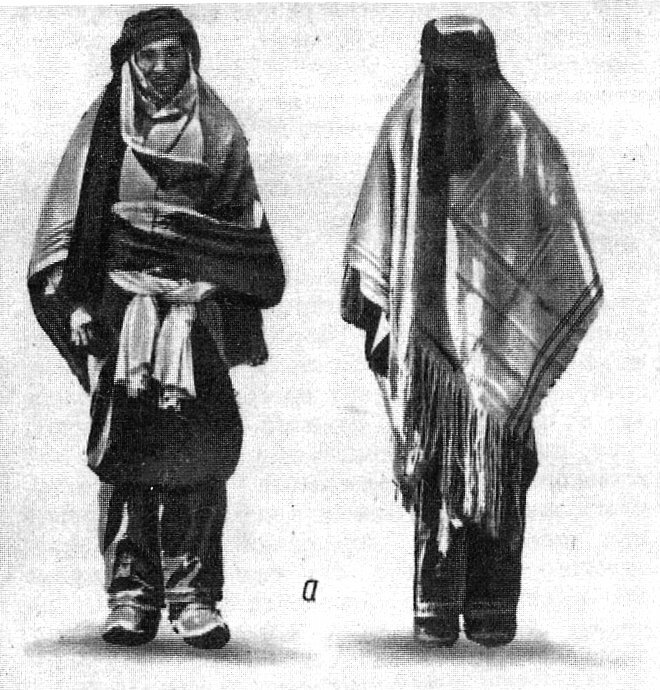 These costumes are from the villages of Tindi and Tidlib. 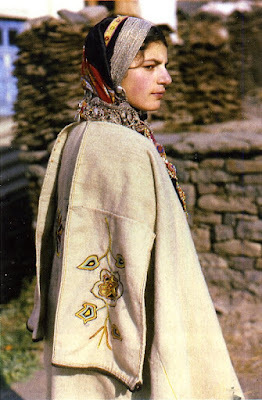 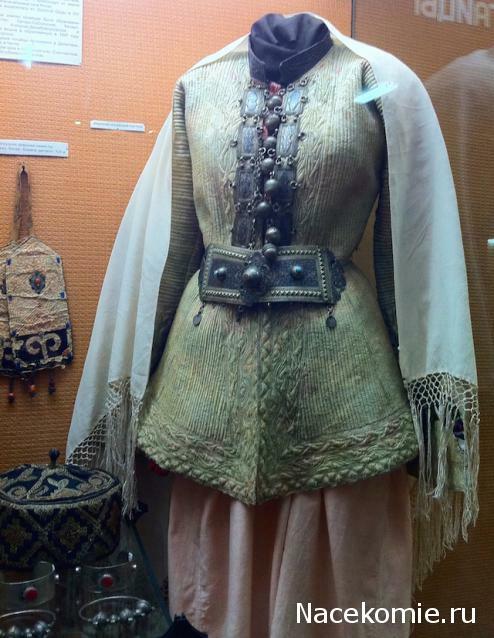 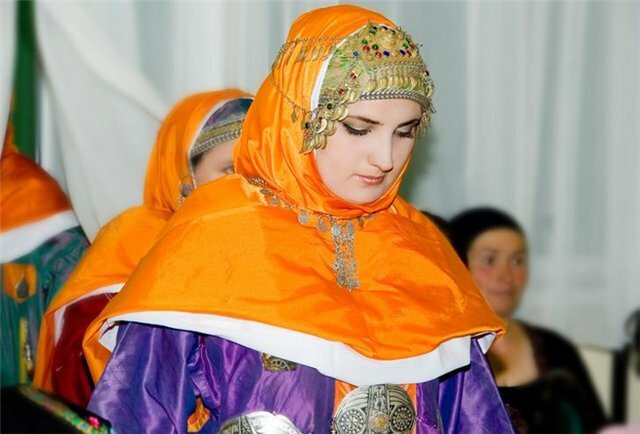 The bridal costume of the village of Rugudzha is spectacular. These languages are numbers 16 through 23 on the map above, in the northern part of this corner of Dagestan. 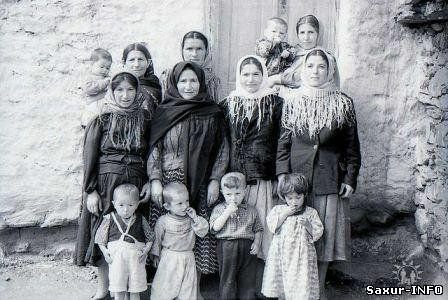 They are Andi, Akhvakh, Bagvalal, Botlikh, Godoberi, Karata, Tindi, and Chamalal. 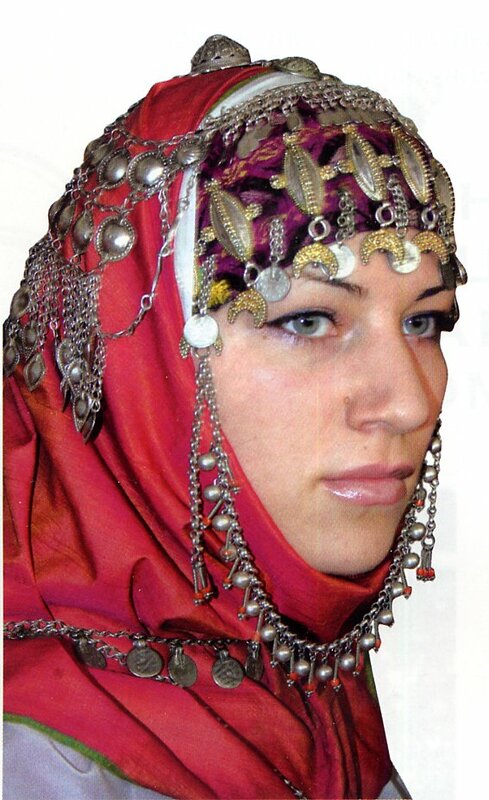 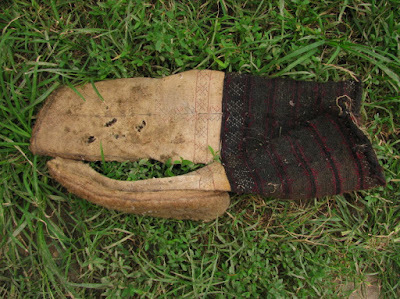 They are found between the Chechen border and the Avar area, northeast of the Dido group languages. 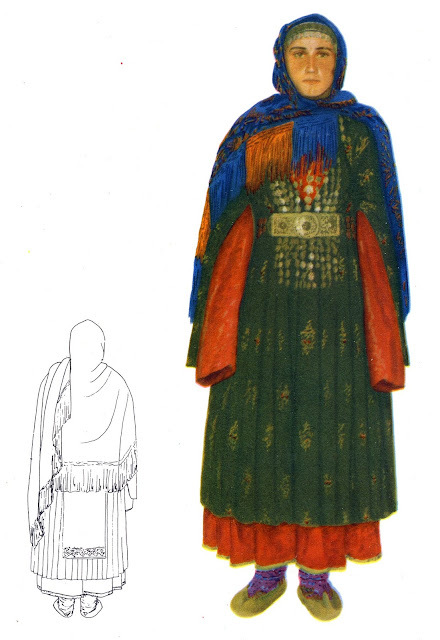 These and the Dido peoples are lumped in with the Avars in some sources. 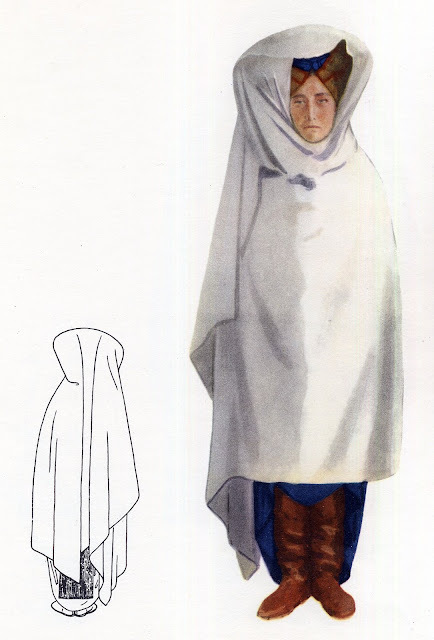 Be careful. I have found no information for the Godoberi or Chamalal, and very little on the Akhvakh and Karata. 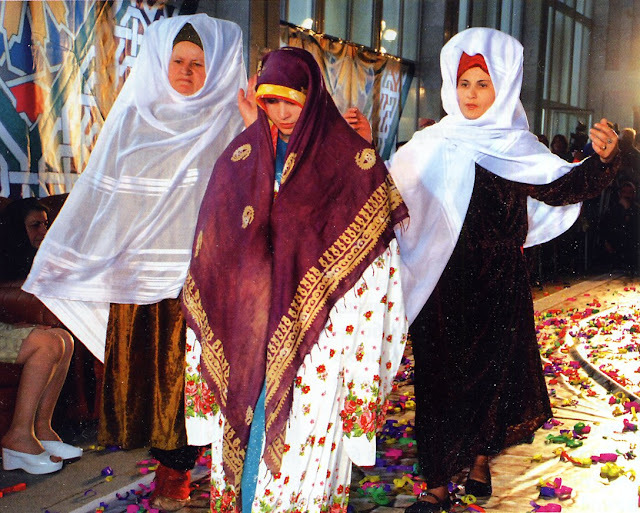 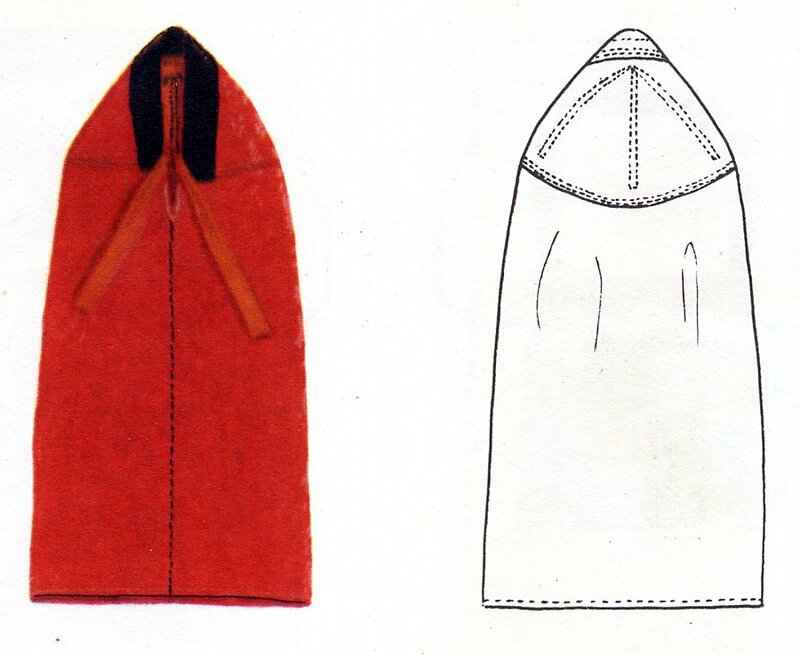 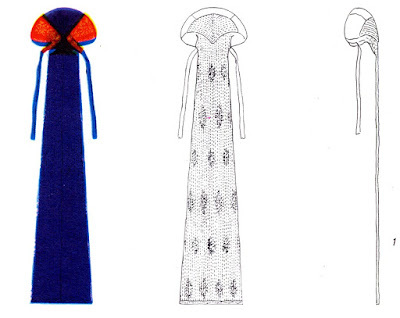 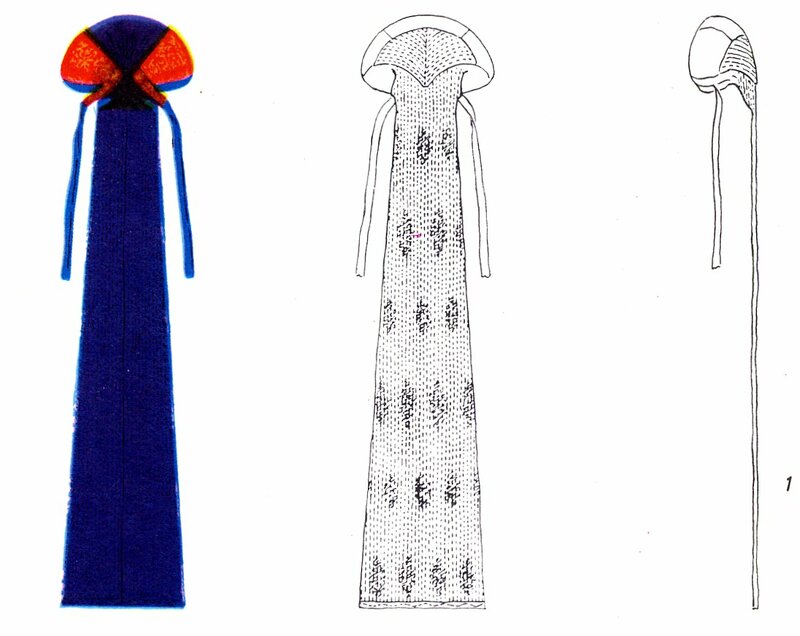 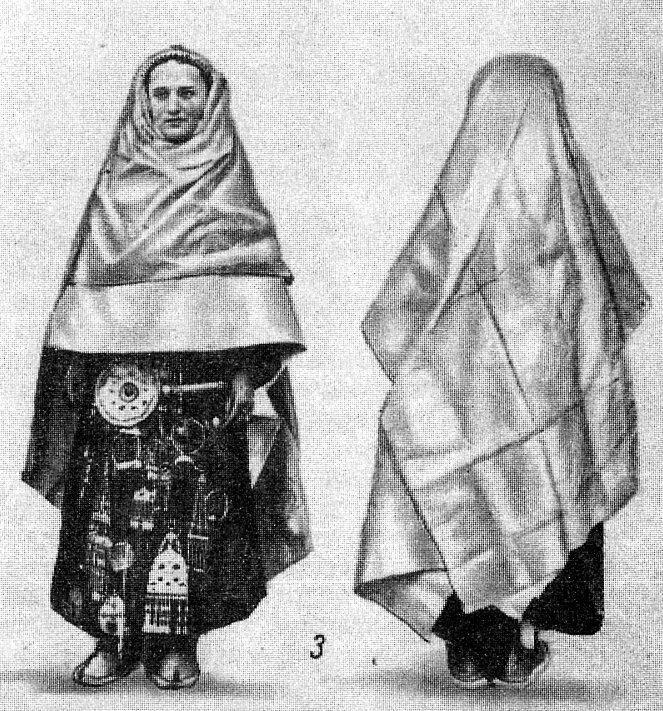 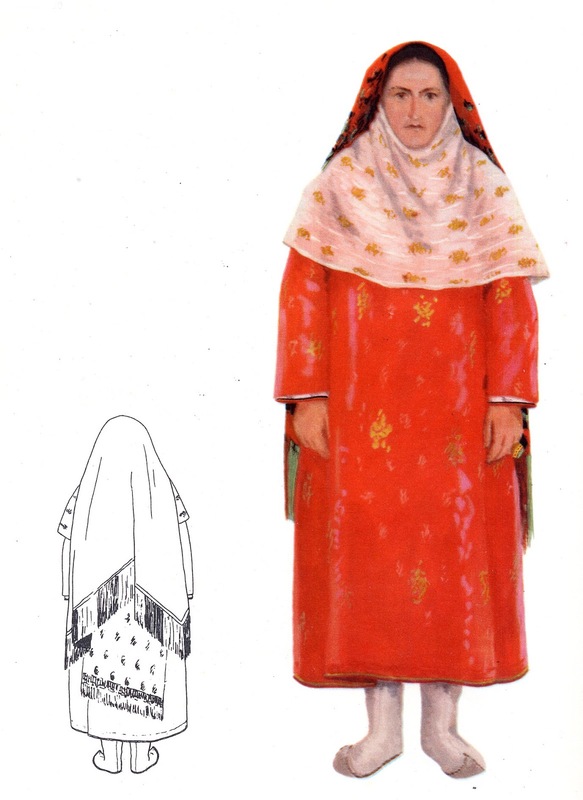 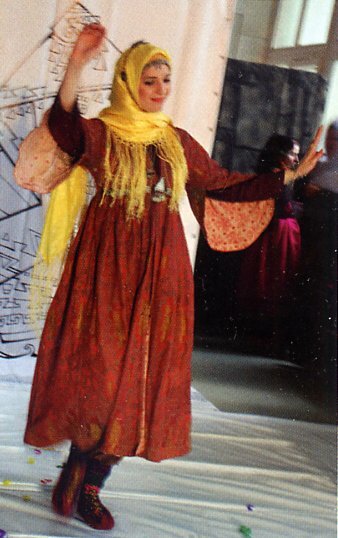 The Andi costume is most noted for the extremely large headdress of the married women. 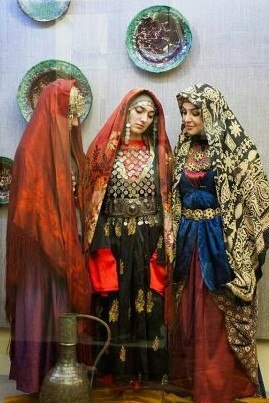 The young woman in the middle is a bride. 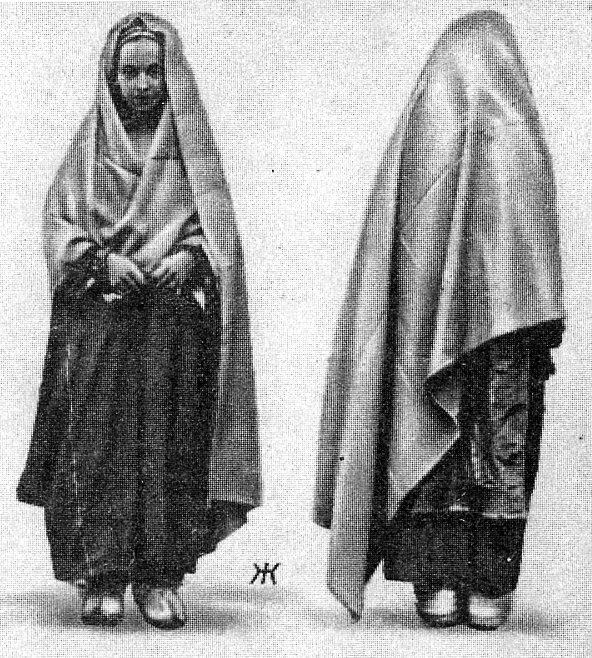 Note that the end of the headdress hangs almost to the ankles. 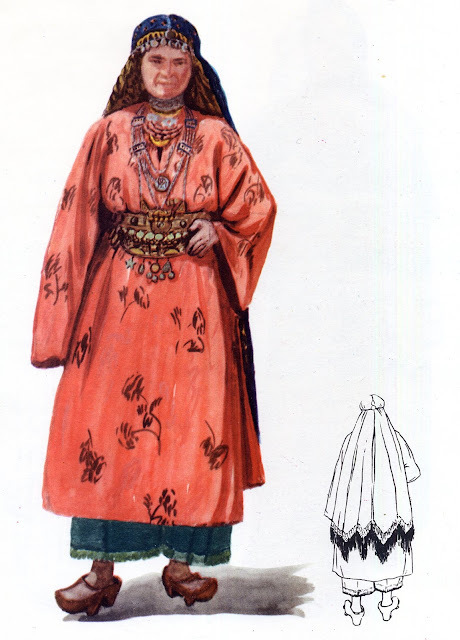 I have found only one image from this group in contemporary dress. 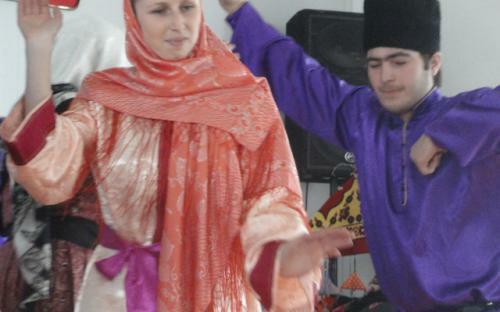 These people took part in a cultural event. 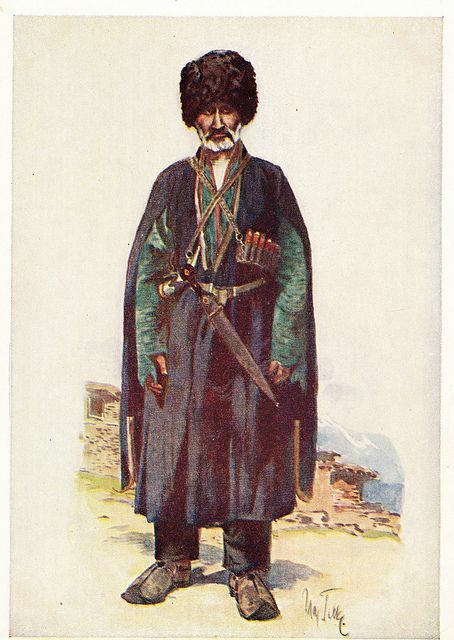 At least some are Akhvakh. 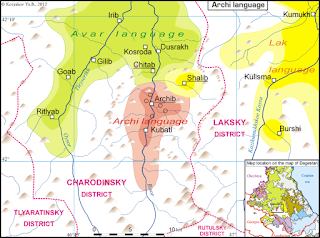 The languages in this group are Tsez, Hinukh, Bezhta, Khwarshi and Hunzib, numbers 25 to 29 on the map above. They are found in the northwest corner of Dagestan, along the Georgian border. 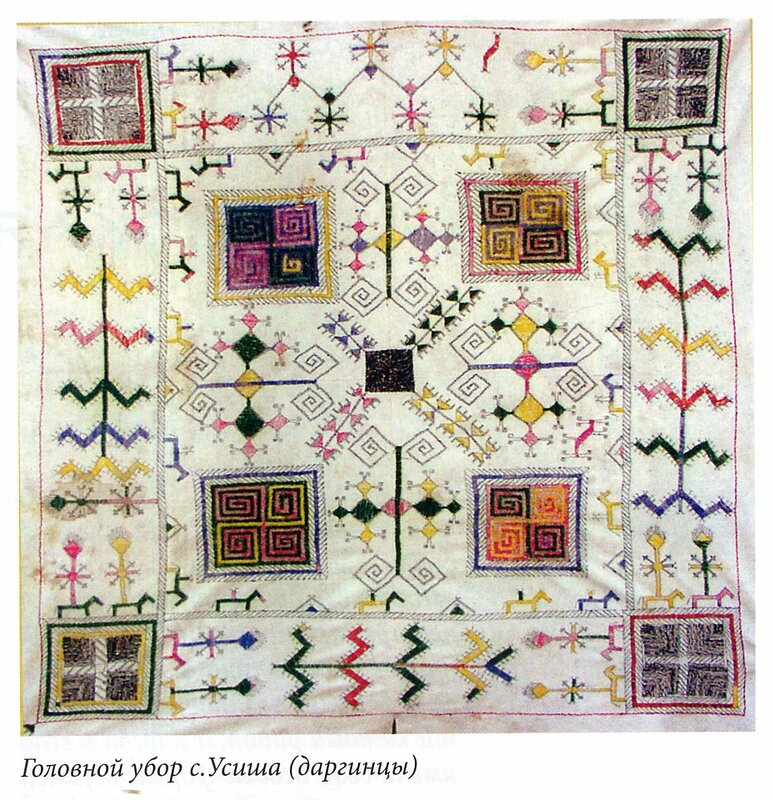 Again I have found no material for the Hinukh or Khwarshi. 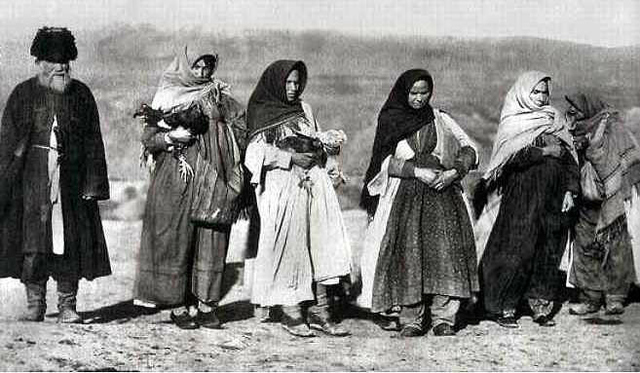 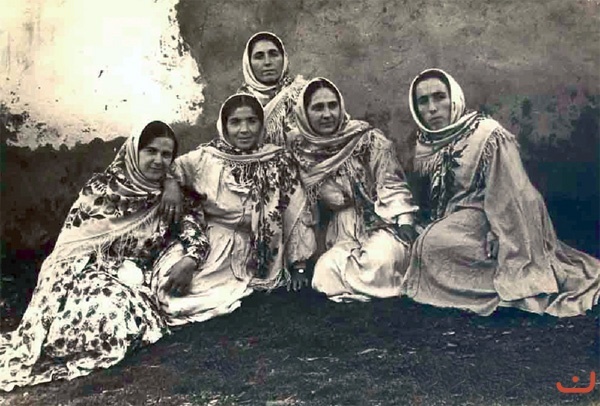 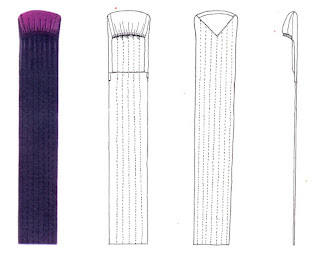 This image shows a group of Dido or Tsez as they dress today. 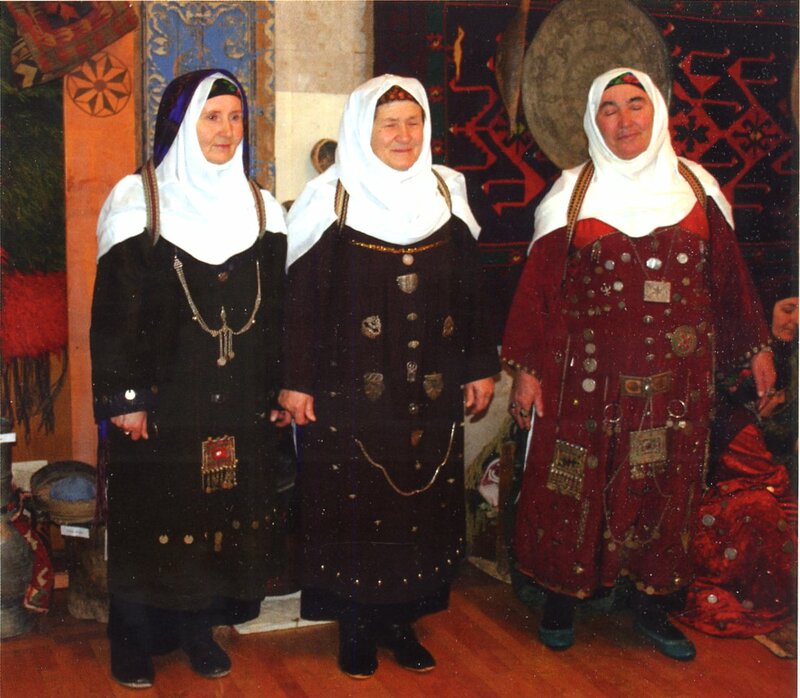 There are three peoples in this zone, each of which is often considered to be an isolate branch of the Dagestan language family. 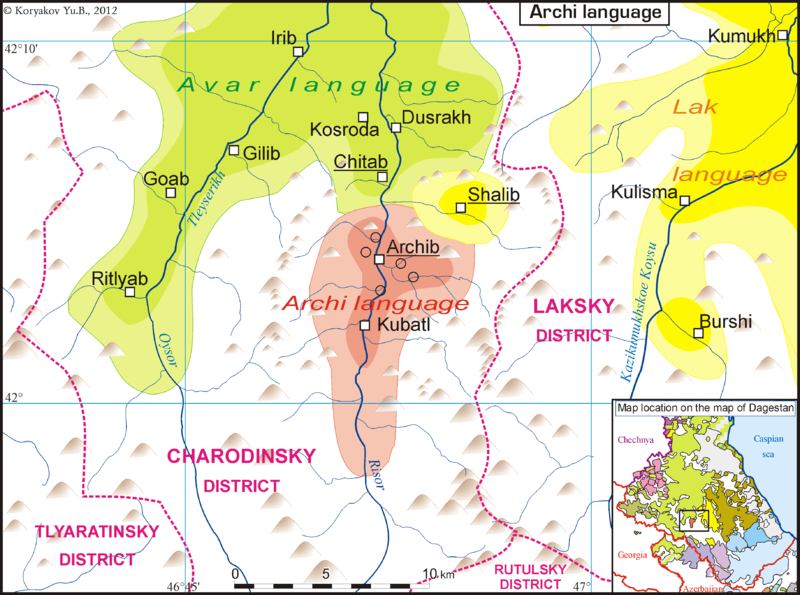 The Dargin, the Lak, and the Archi. The Archi live at the head of one valley. 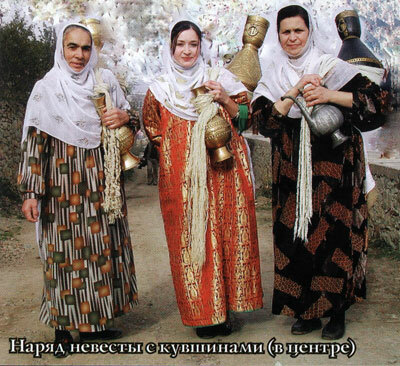 This language is especially complex, even by the standards of Dagestan. 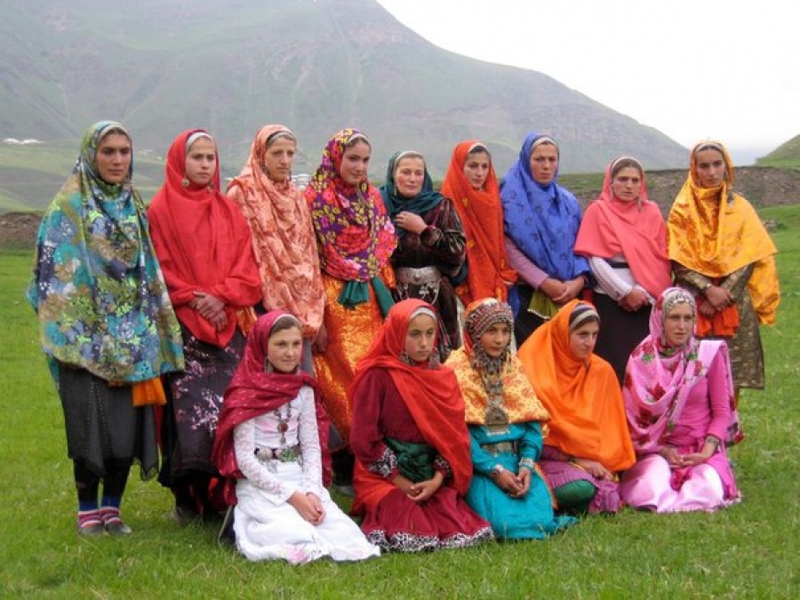 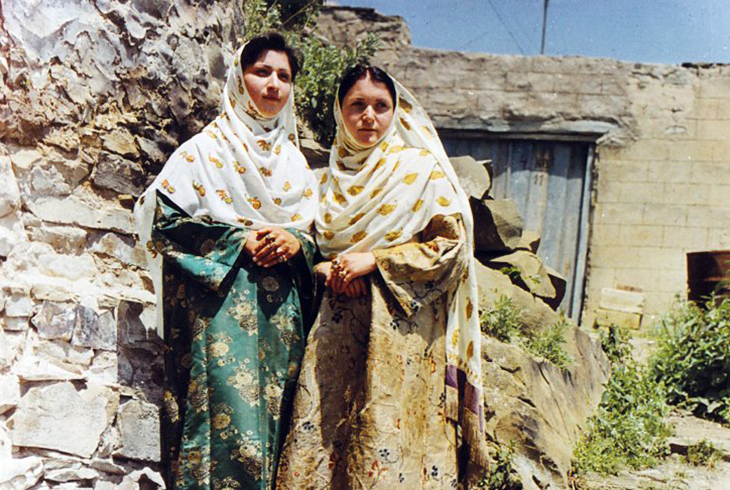 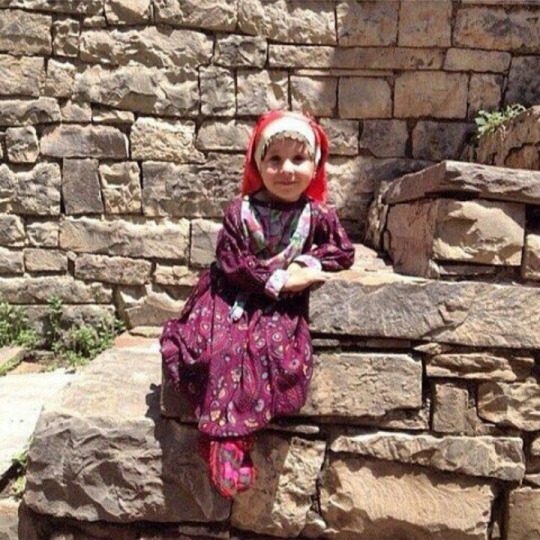 The village of Balkhar has kept its traditional clothing very strongly. 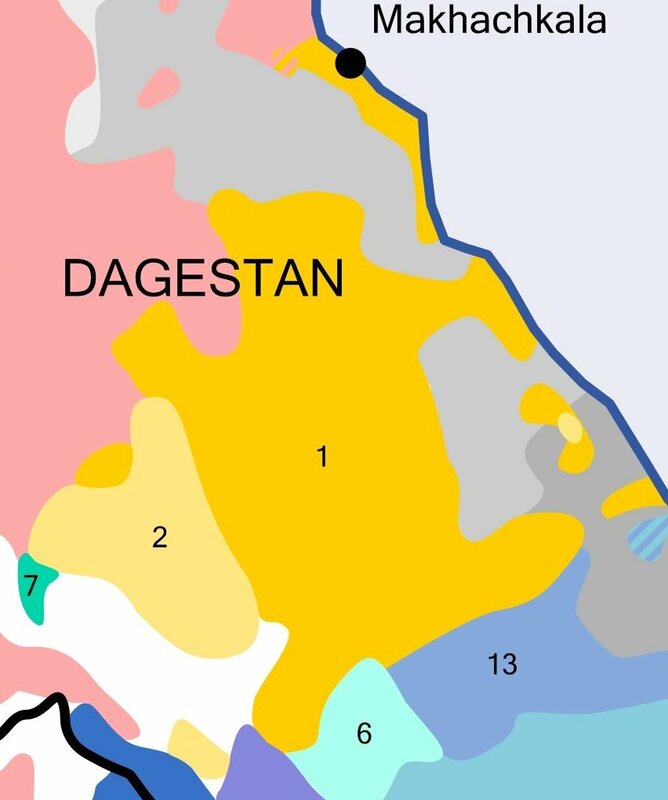 The Dargin speak Dargwa or one of four other dialects, which are sometimes separated as distinct languages, Kaitag, Itsari, Chirag, and especially Kubachi. 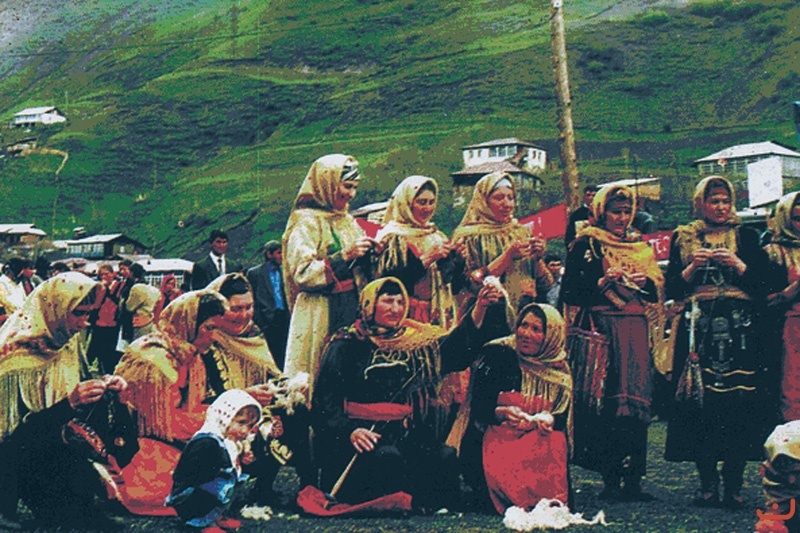 Karatsan village, Kaitag tribe. 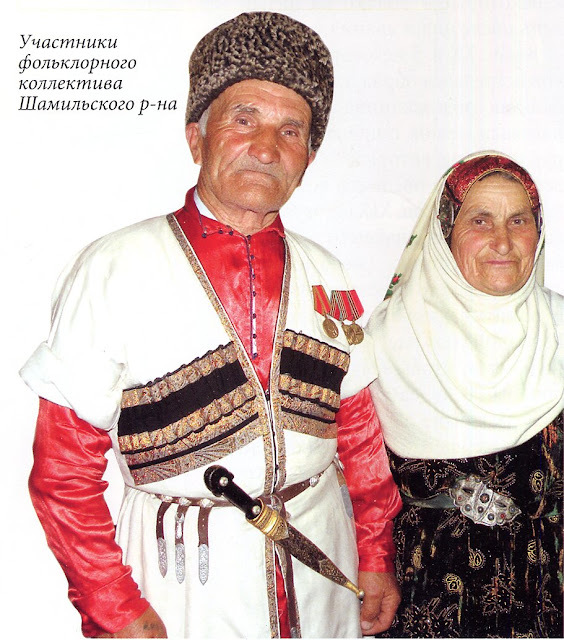 These people speak a dialect which is sometimes considered to be a separate language. 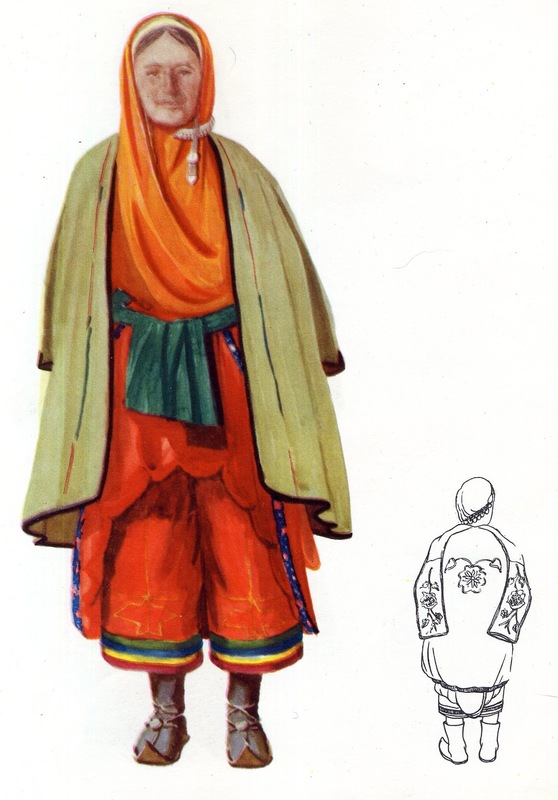 They are also famous for their embroidery, which, however is not used on their costume. 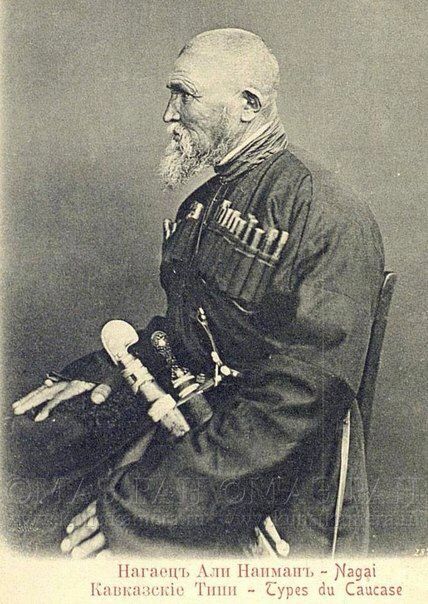 The Kubachi speak a divergent dialect which is sometimes considered to be a separate language. 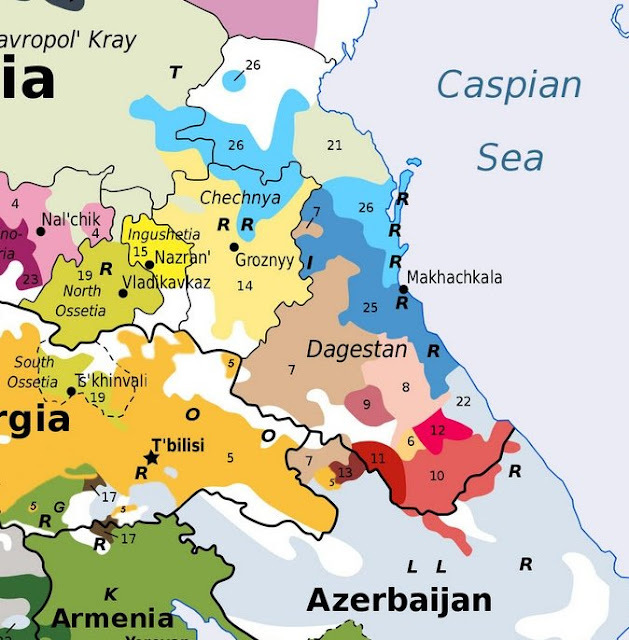 The southern zone is the land of the Lezgic languages, numbers 6 through 15 on the map above, although not all of them are spoken within the borders of Dagestan. 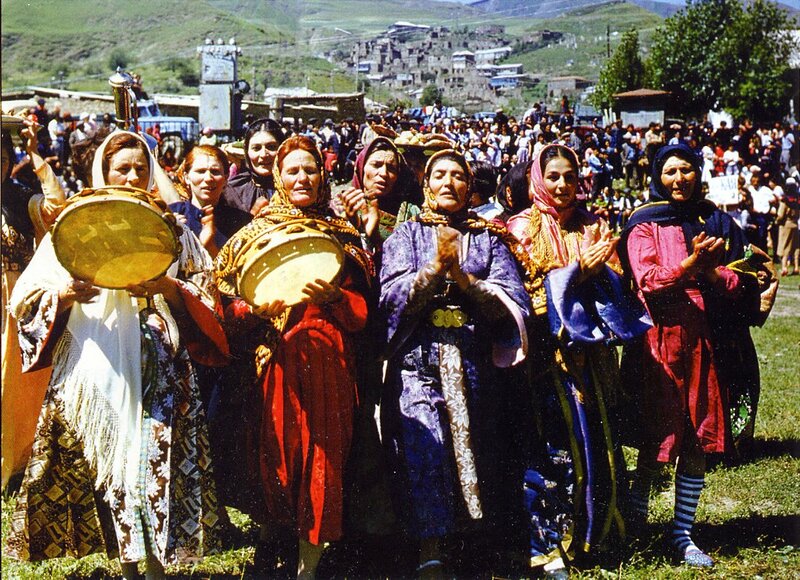 The ones that are include Tsakhur, Rutul, Agul, Tabarasan, and Lezgin. The costumes of this zone more closely approach the standard Caucasian Costume. This is a graceful costume. 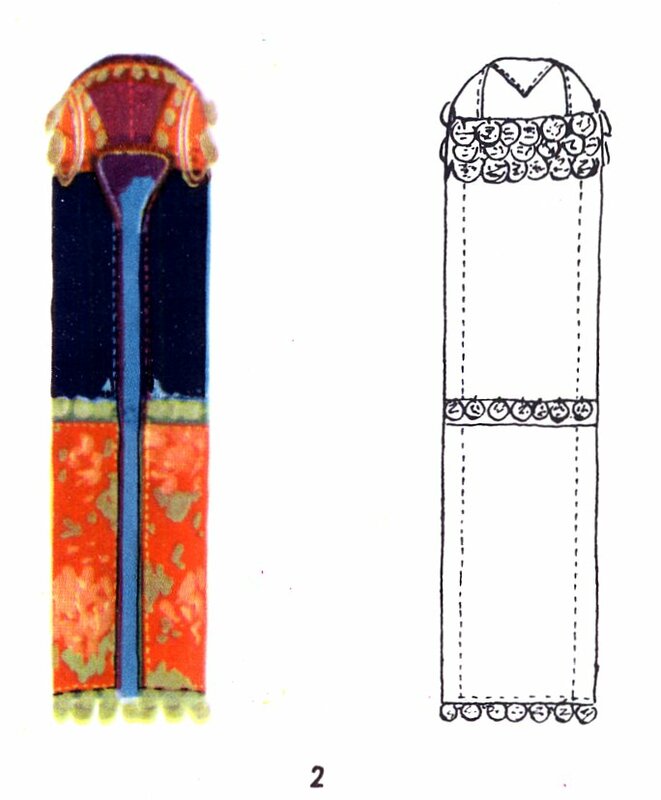 One of the most distinctive features is the loose frontal ornament of linked coins. The Lezgins are a relatively large group. 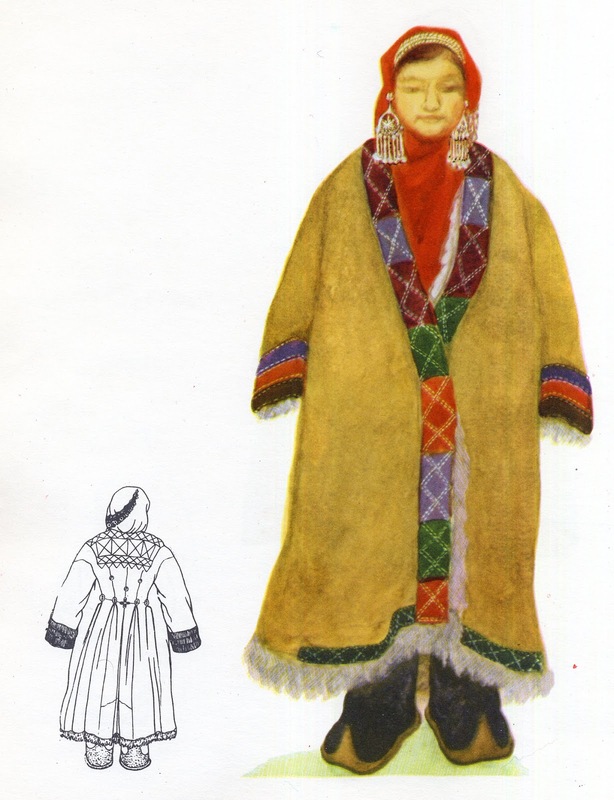 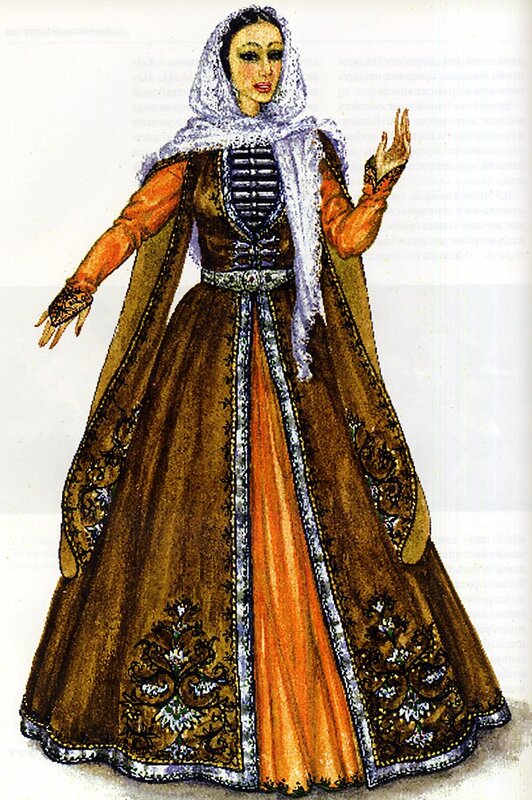 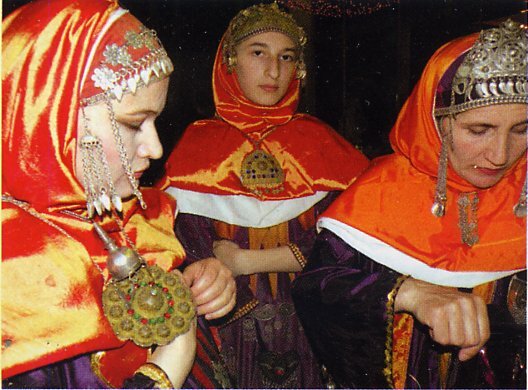 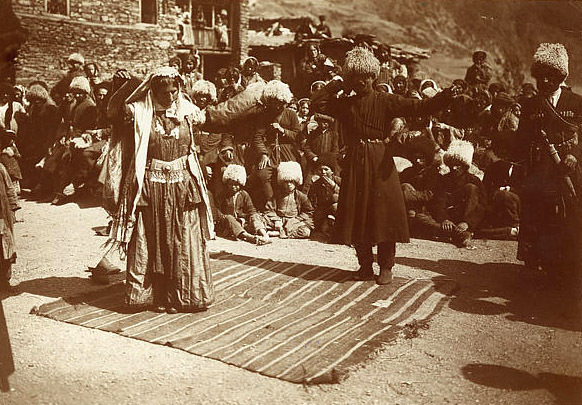 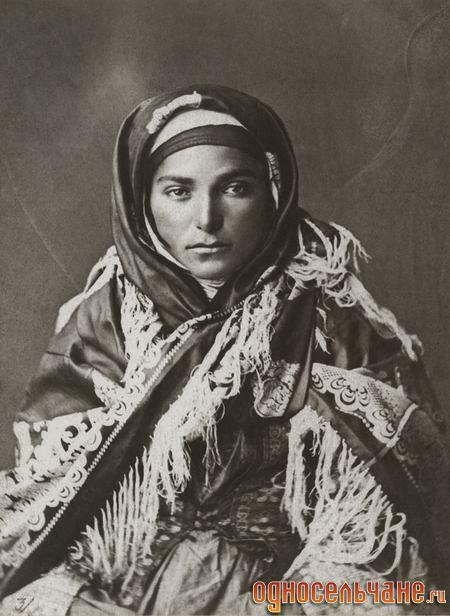 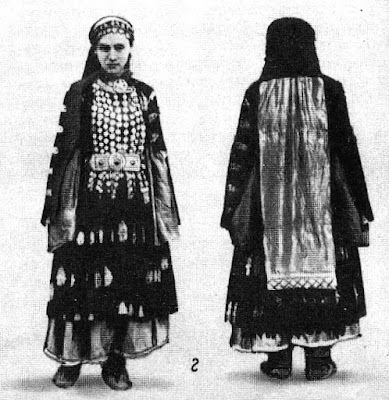 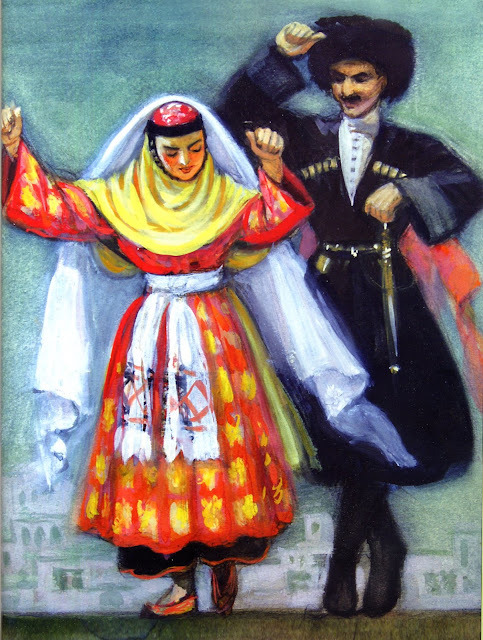 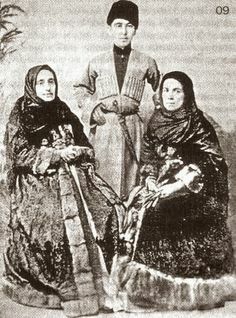 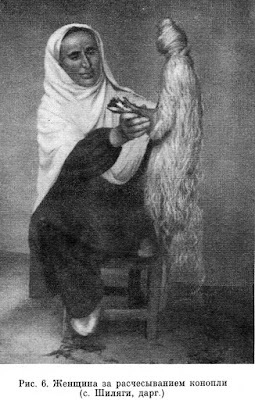 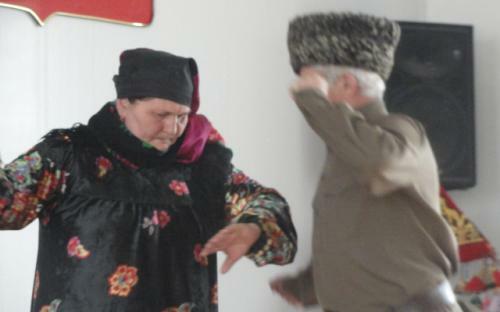 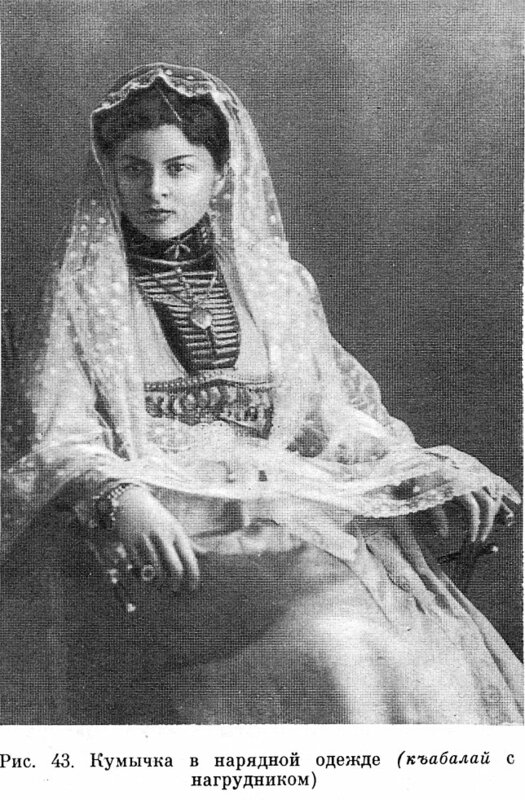 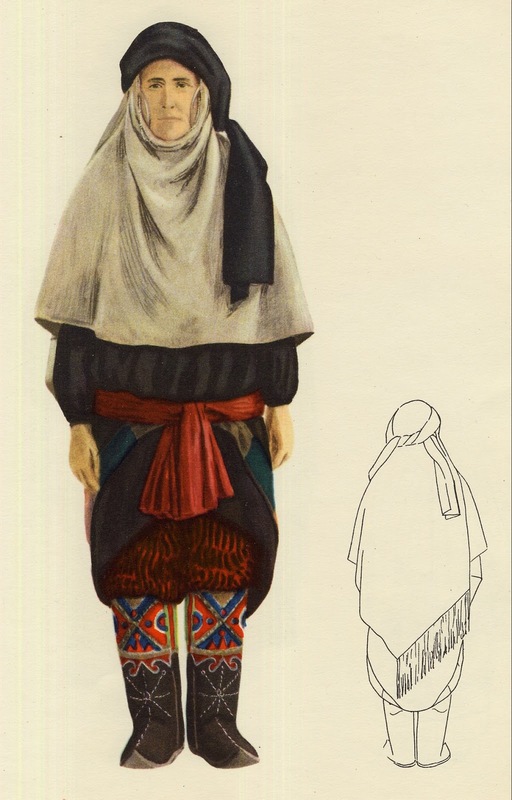 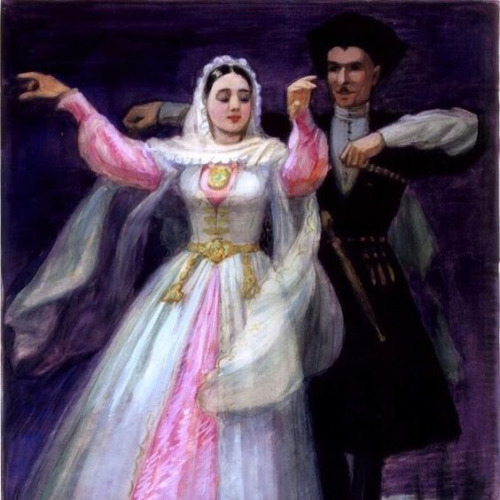 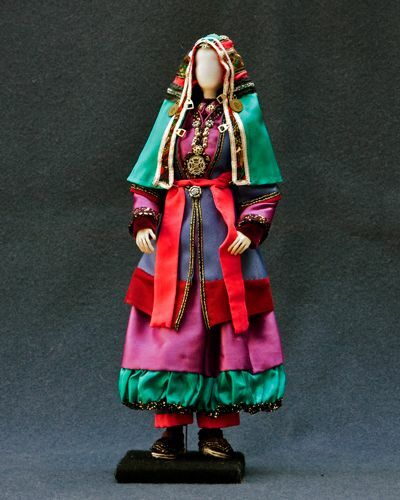 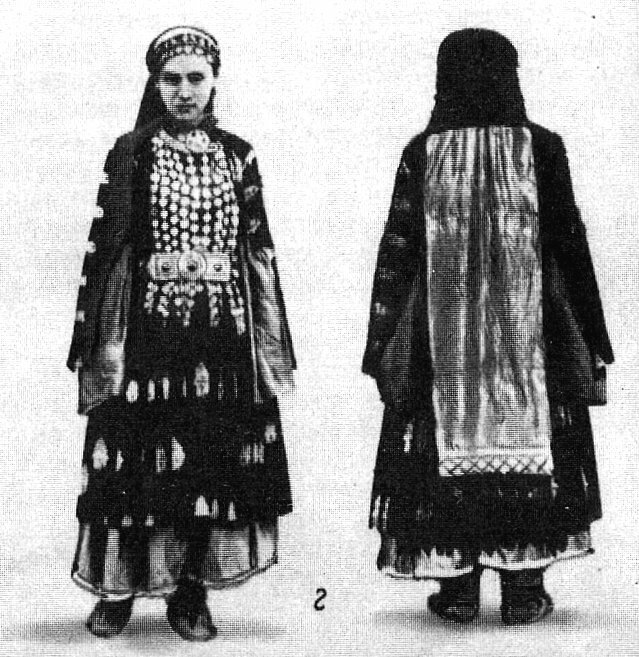 The difficulty with researching their costume is that the tern Lezginka, which means a Lezgin woman, also refers to a dance form which is popular throughout the Caucuses and even into Russia. 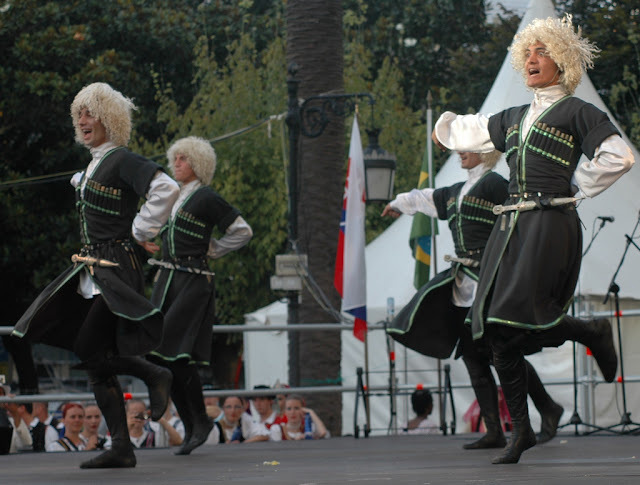 Many images are of various groups from various ethnicities doing this dance in flashy stage costumes. 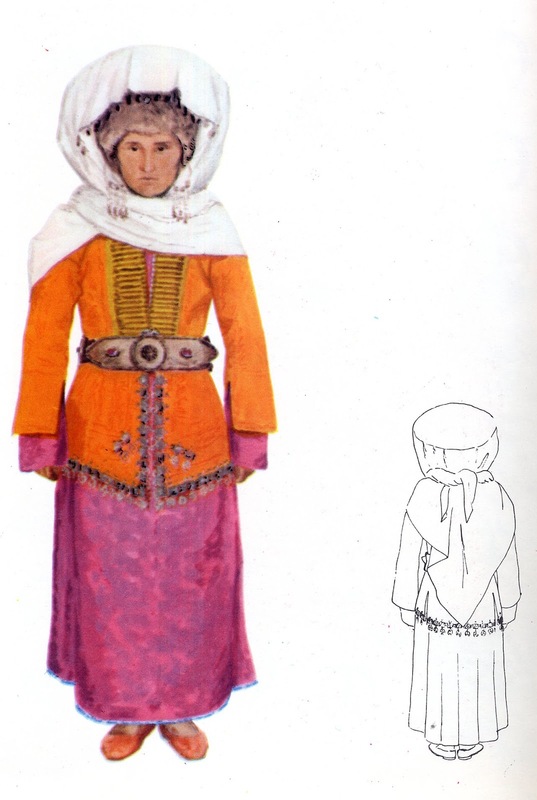 I here present what I think are more authentic images of actual Lezgin outfits. 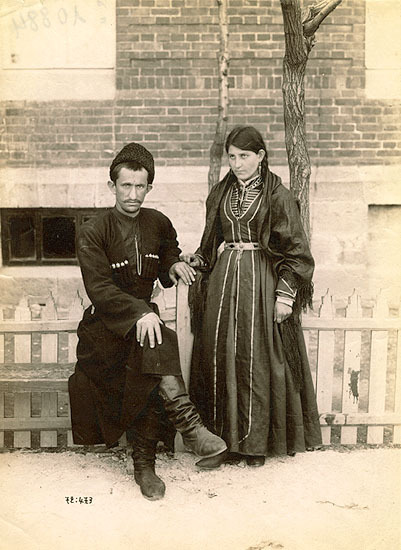 We have now reached the southern border with Azerbaidjan. There are a few small Lezgic groups which live south of this border, but little is known about them. 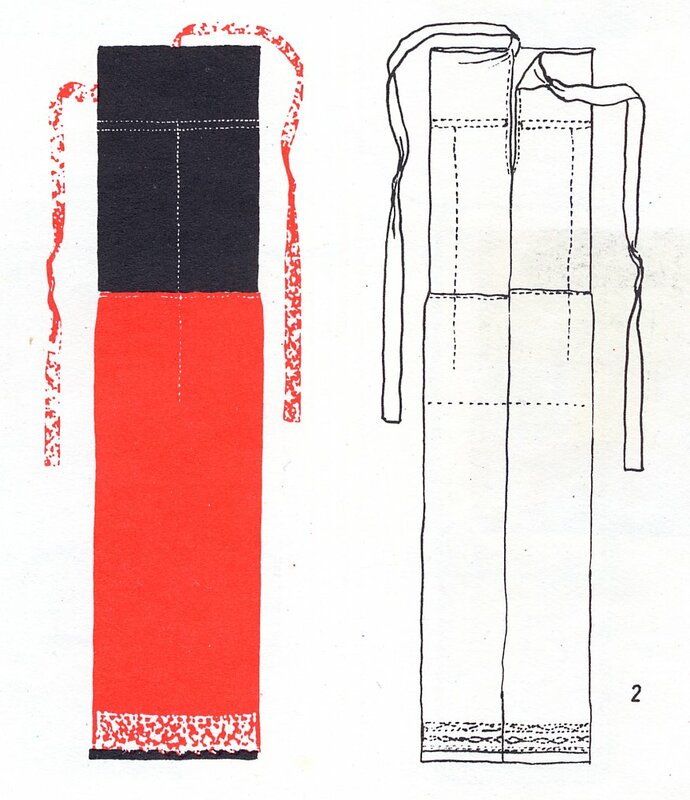 some of this material I got from a few blogs online. Thank you so much, beautiful culture and great research, much appreciated.